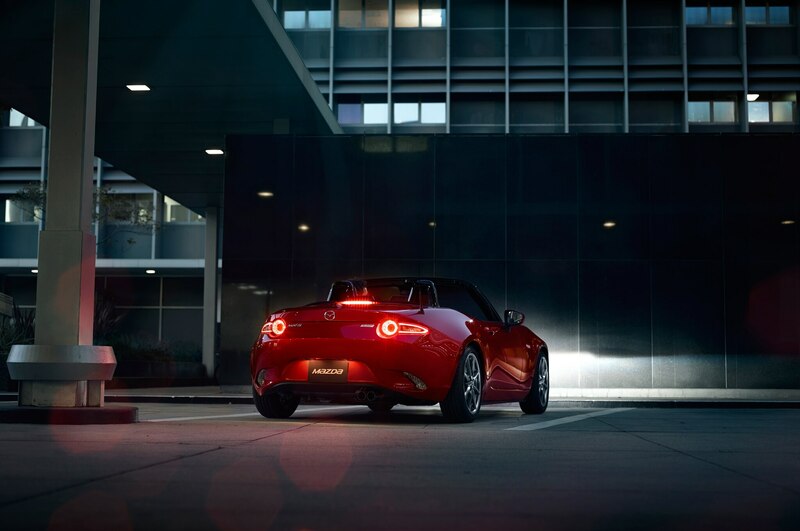 A car worth getting up early for. 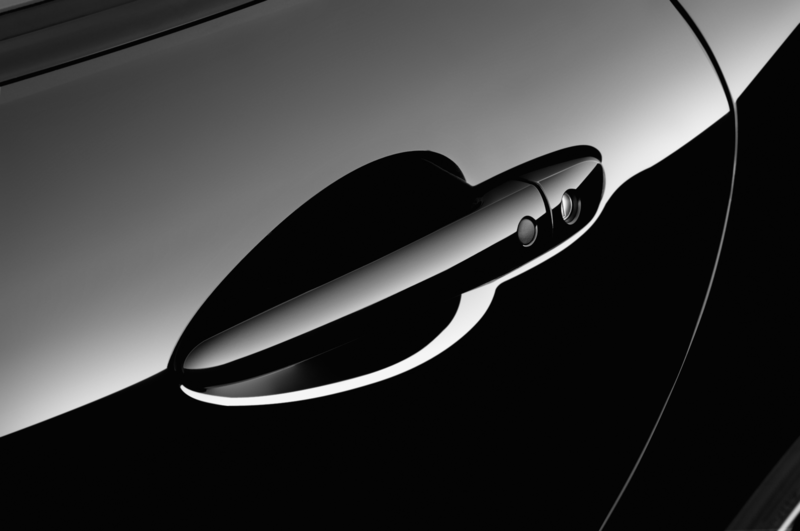 My iPhone’s alarm insists I wake up just after 6 am, as does the sun that is already prying its way past the blinds of my east-facing bedroom window. 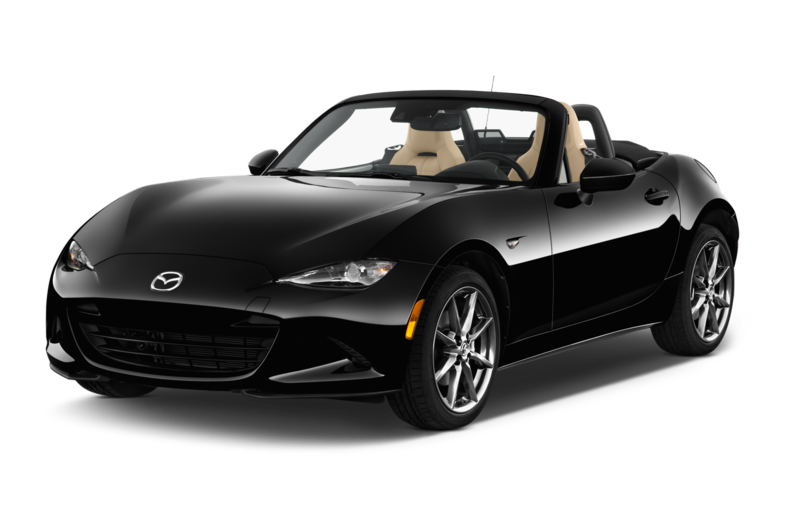 Normally, I’d hit the snooze and catch a few more minutes of shut-eye, but on this particular morning there’s a 2016 Mazda MX-5 Miata with a full tank of gas in my driveway. 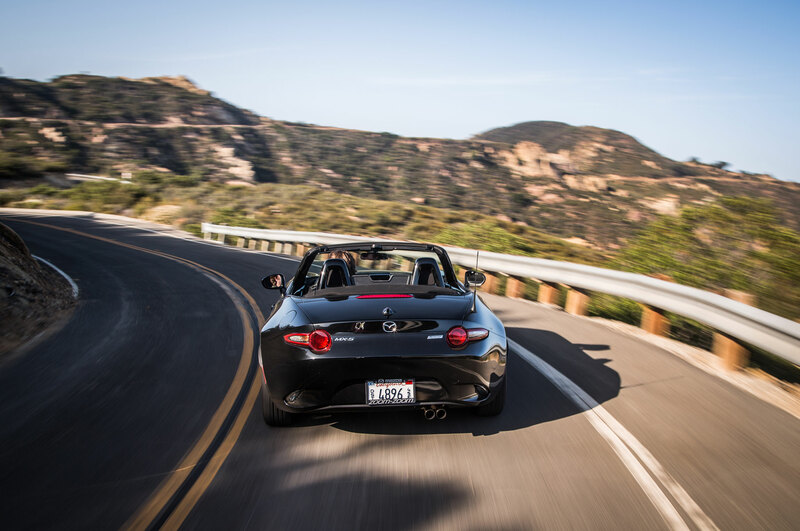 Forty miles north in the hills above Malibu, California, plenty of twisty canyon roads wait impatiently. 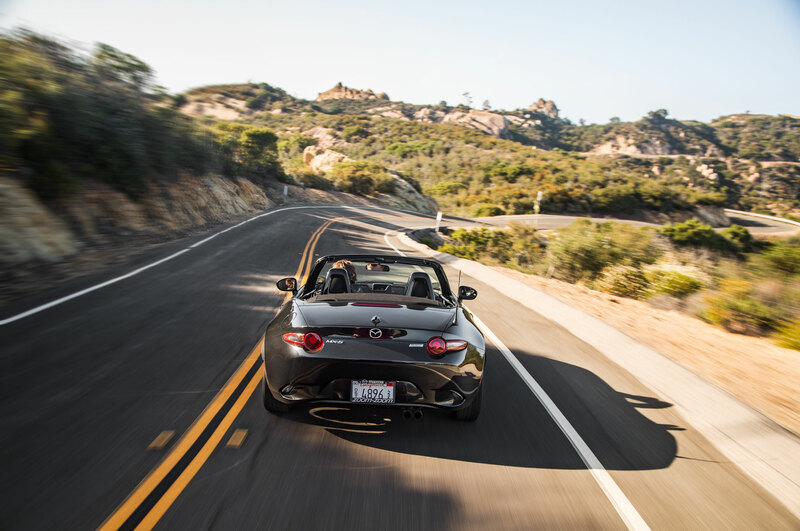 Better get going. 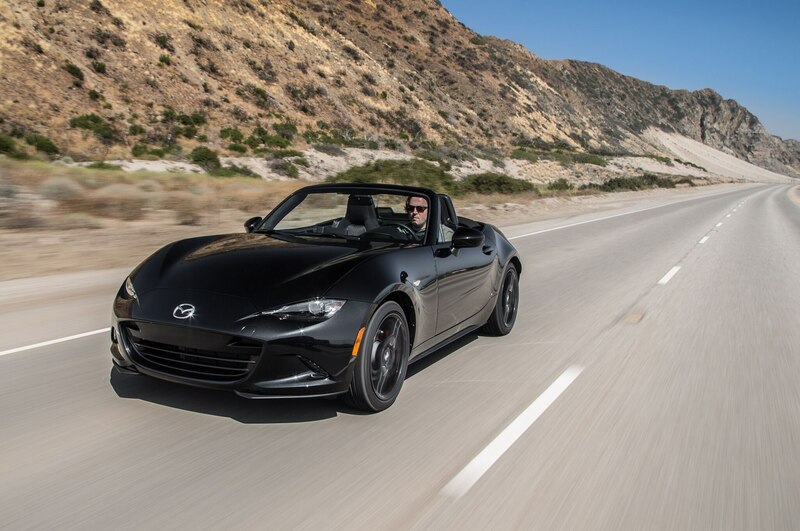 The long slog on traffic-soaked freeways is tough to handle, but the miles spent here make me appreciate the improvements Mazda has made to the Miata to help it cope with situations just like this. 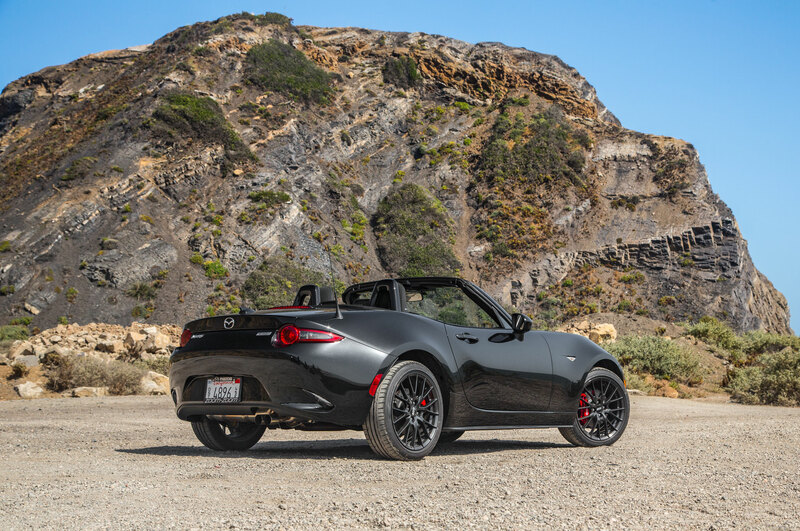 After all, the scores of 200,000-mile Miatas found on Craigslist are a testament to the car’s ability to play daily driver. 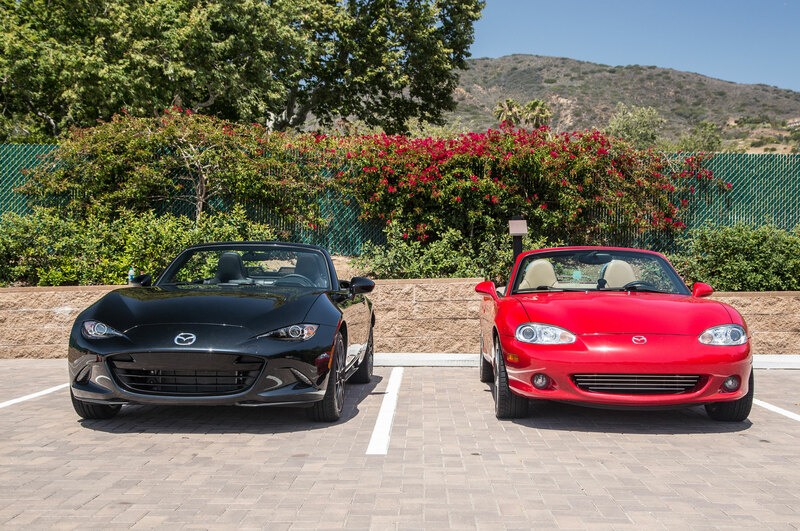 In Southern California, many do. 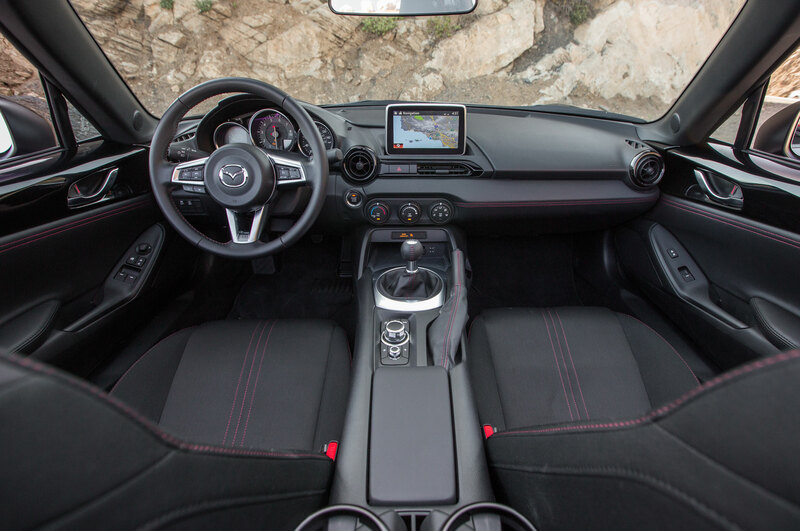 There’s a ton more room inside this 2016 version, despite being 1.5 inches shorter than even the first-generation car (that’s the NA to Miata obsessives). 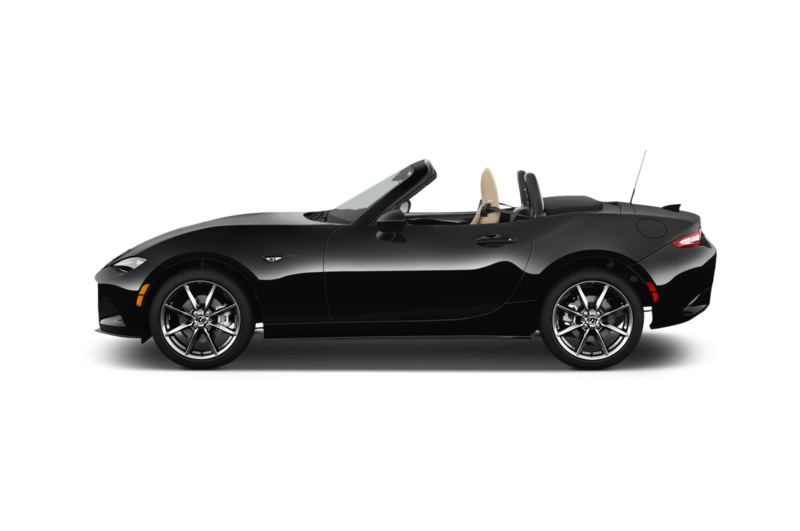 There’s even more room than the NC offers; my left elbow isn’t pressed against the door and the steering wheel doesn’t hit my legs anymore. 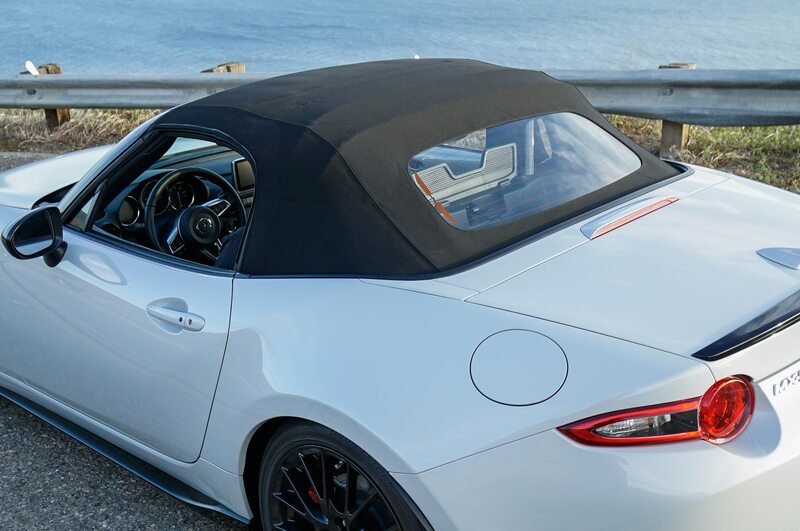 Due to a lower roofline, headroom isn’t appreciably different, but there’s no longer a top frame bar directly above my noggin to hit at every bump in the road. 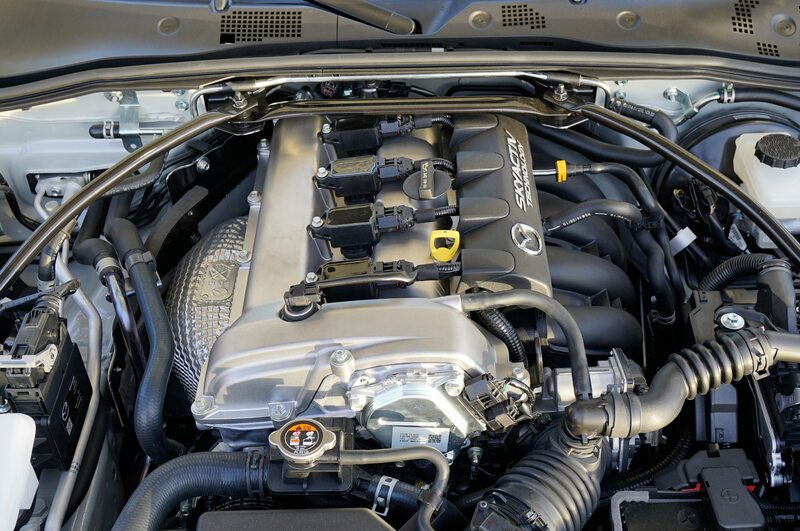 Instead a flat aluminum panel is layered in the front of the top to help block outside noise. 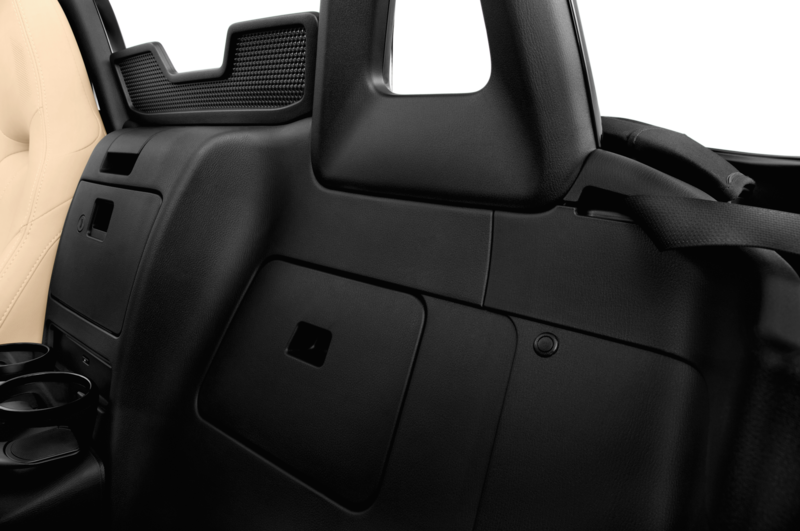 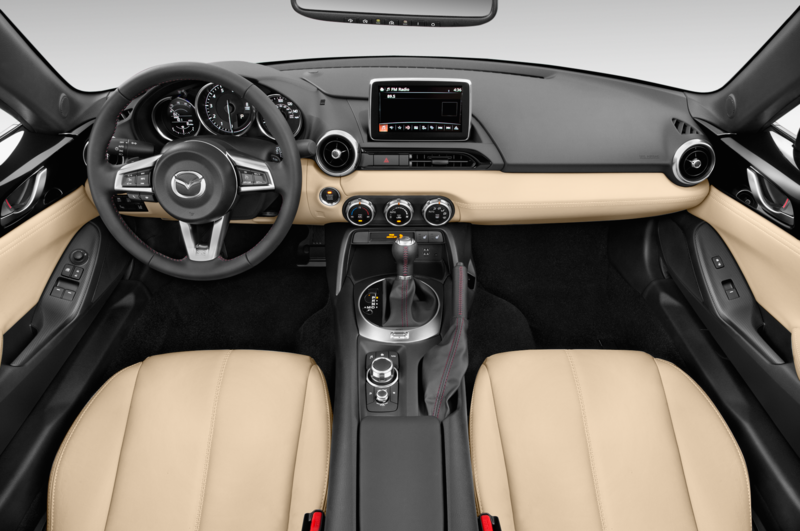 It does the job admirably, making it easy to believe Mazda’s claims that the cabin is 40 percent quieter than before. 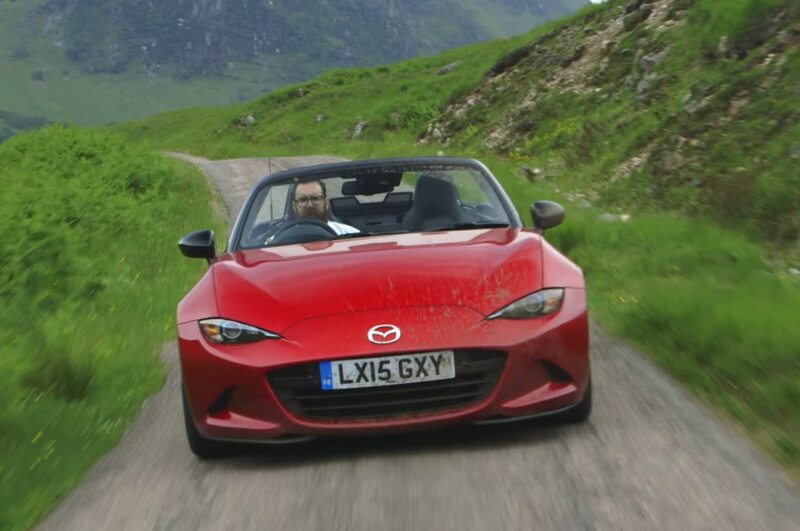 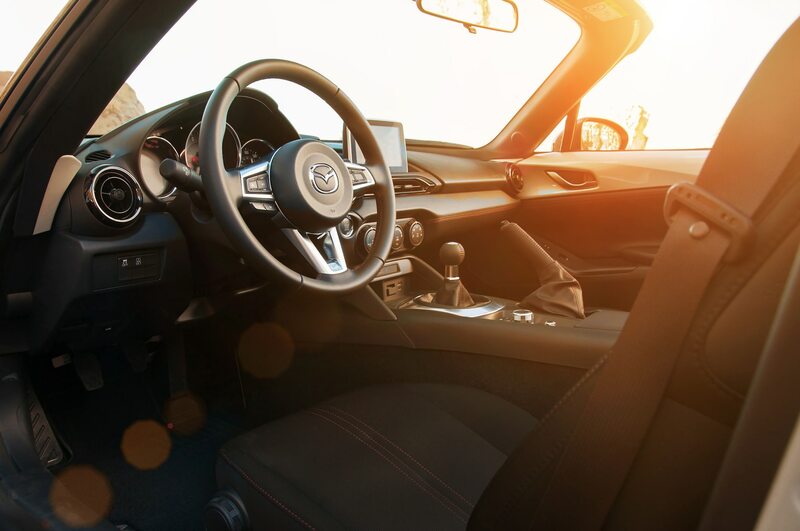 The seats are more supportive and the driving position is lower than before — by 20 mm, says Mazda — a huge improvement from the tall, hard chairs in the NC. 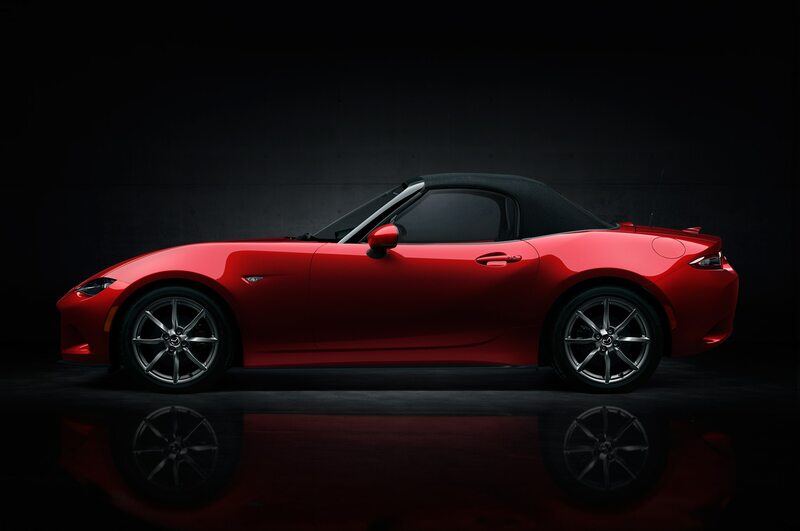 With the low window line and the feeling that I’m sitting down in the car, rather than on top, the essence of the original Miata comes flooding back. 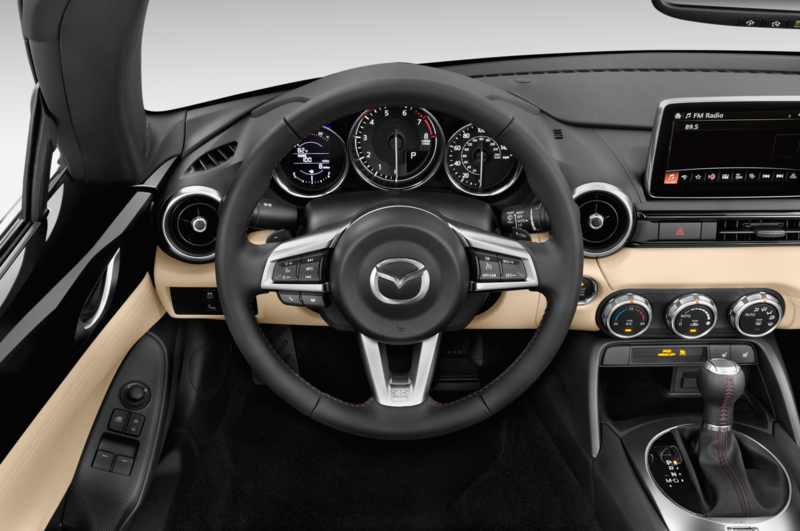 My only wish is for a telescoping steering wheel — my feet are still a touch too close to the pedals or my hands are too far from the steering wheel. 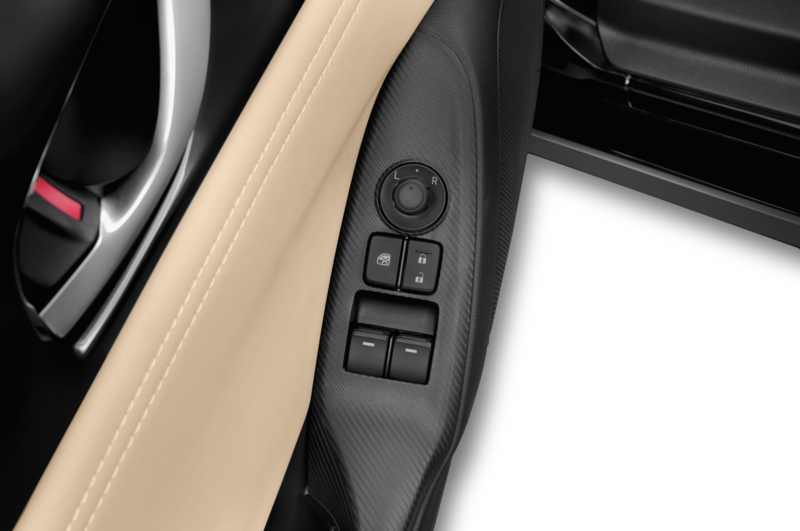 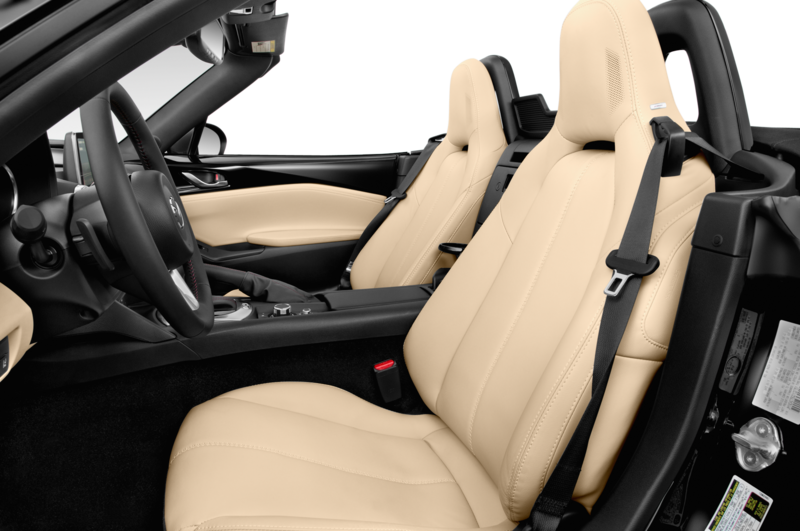 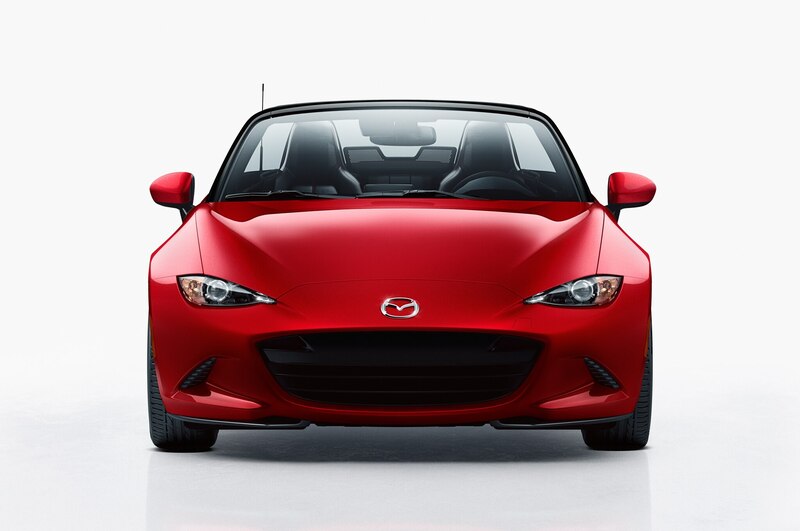 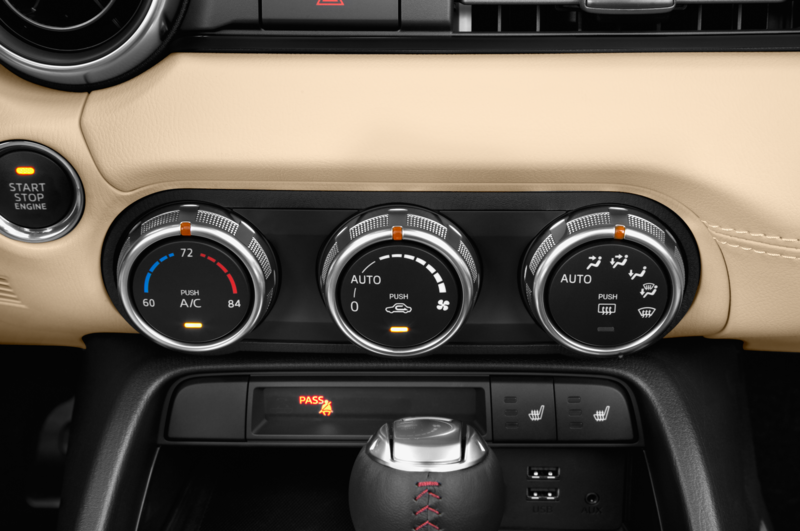 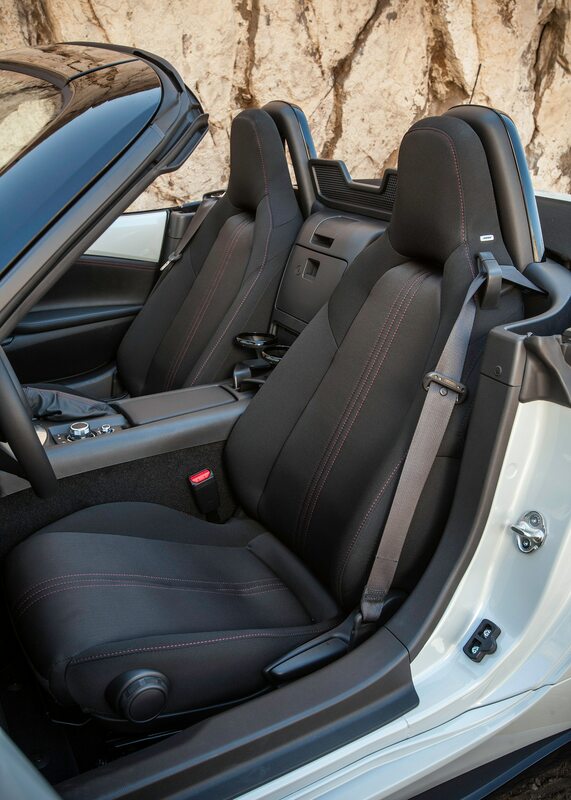 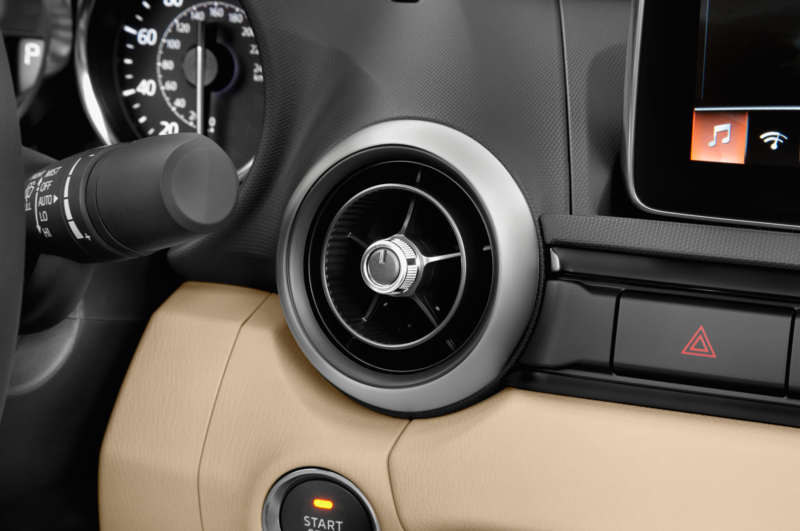 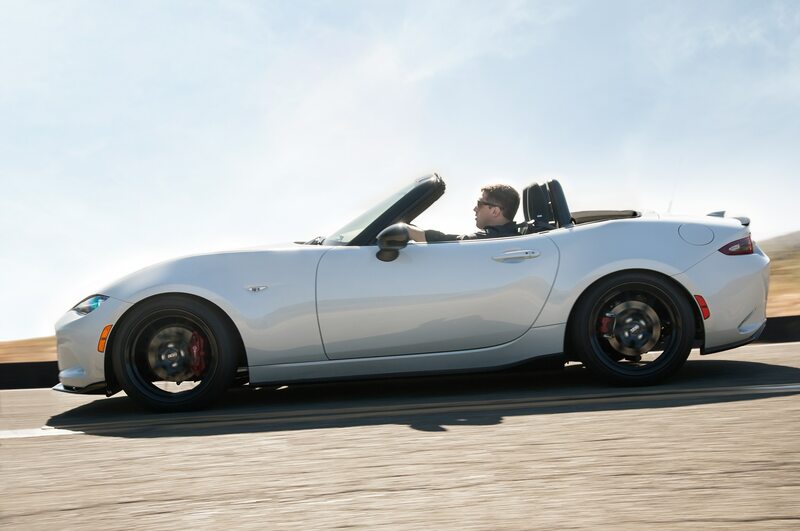 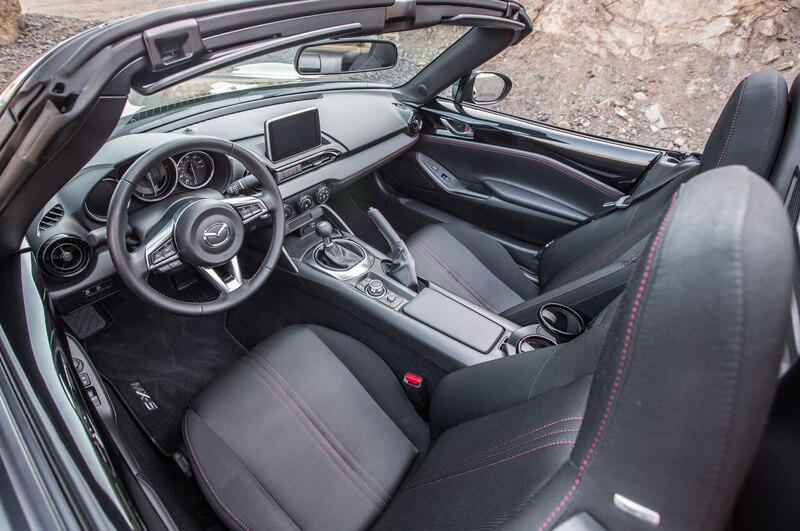 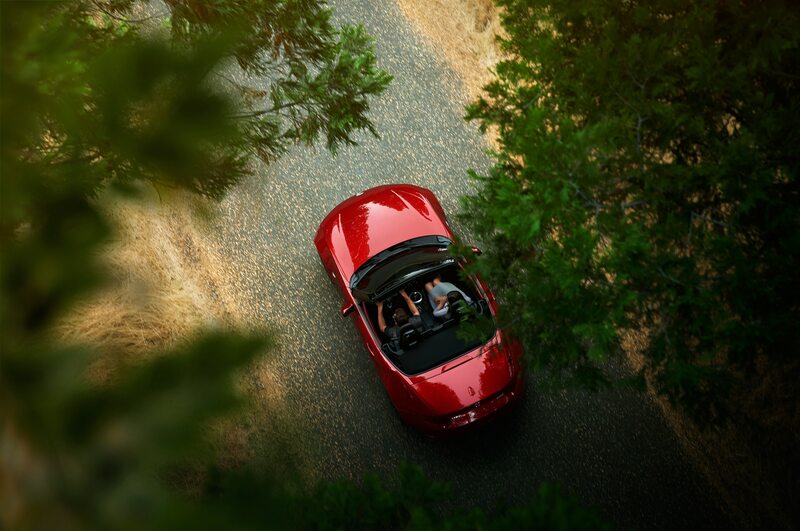 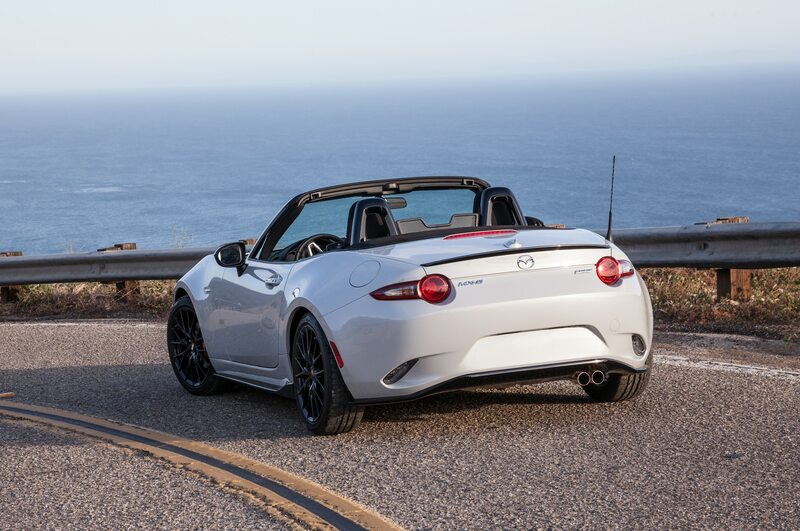 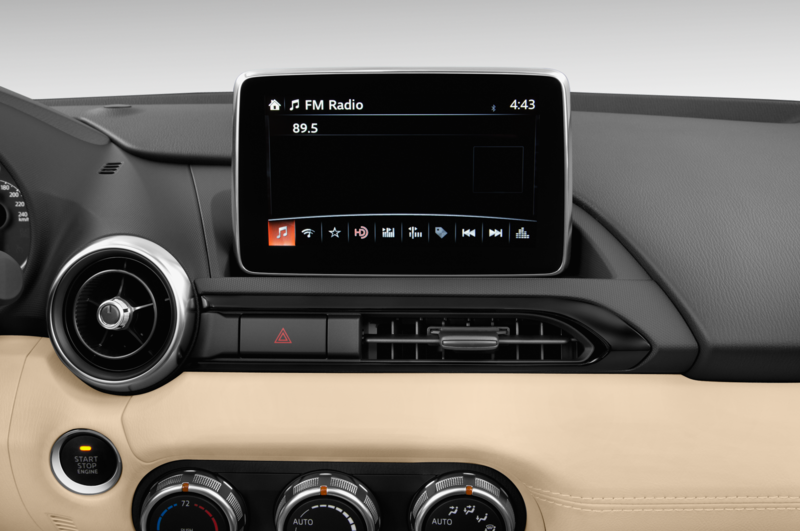 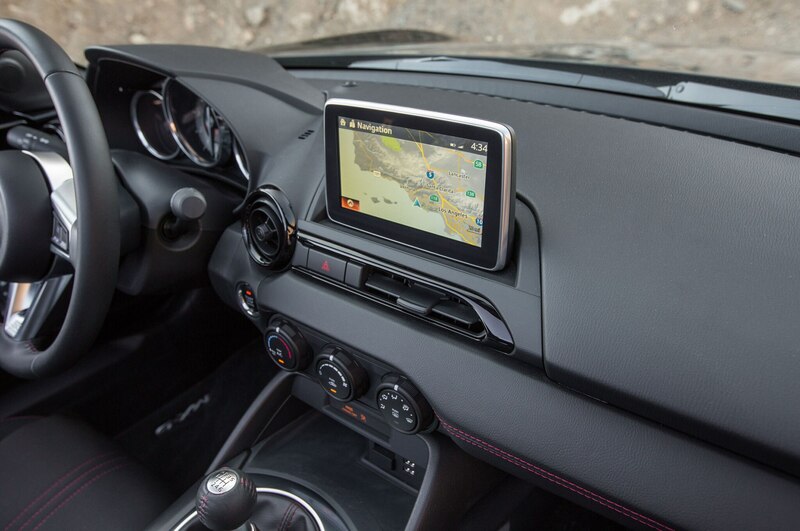 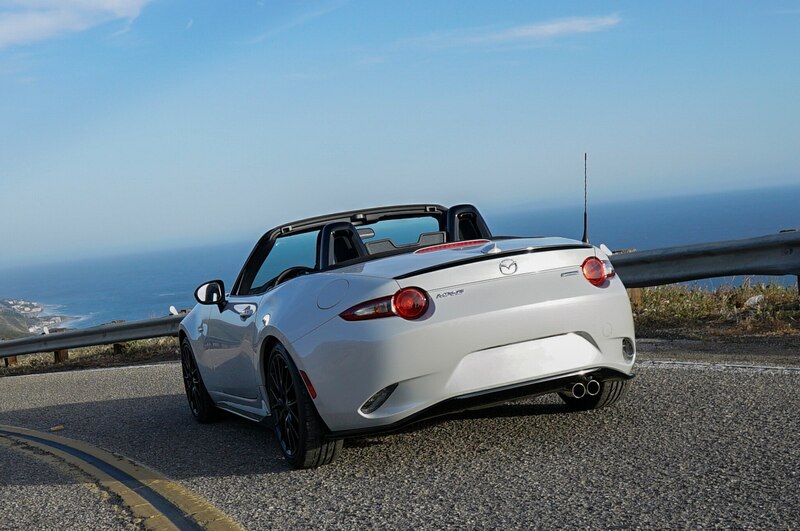 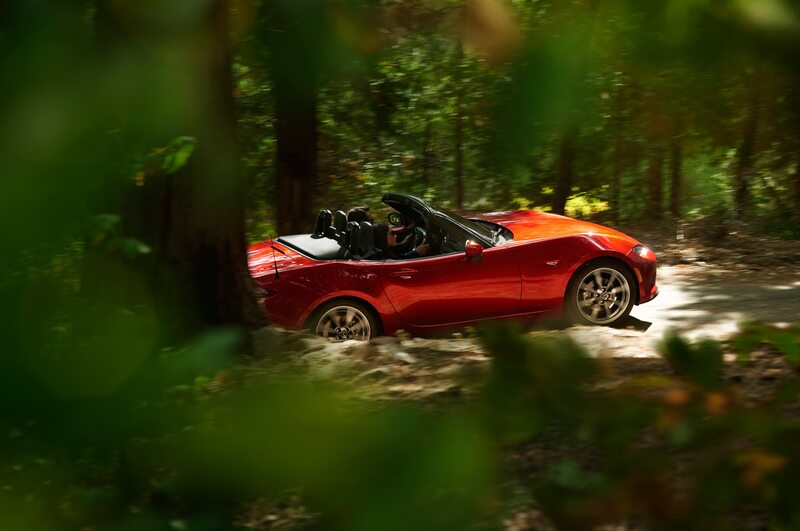 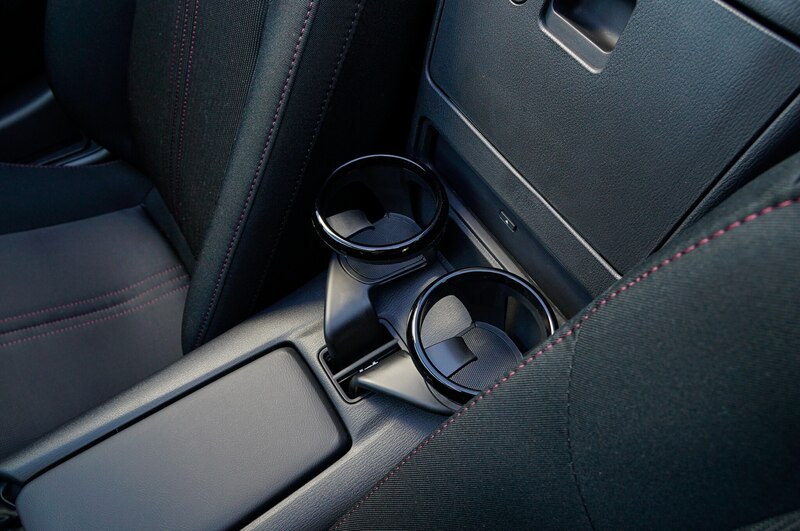 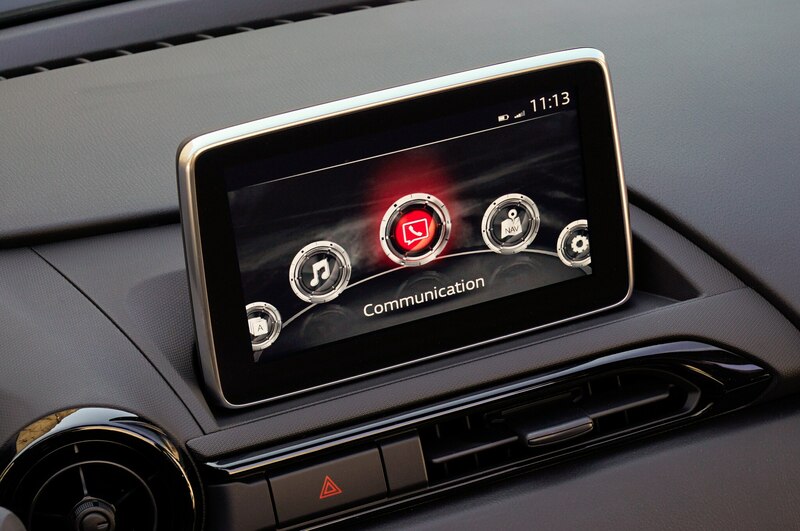 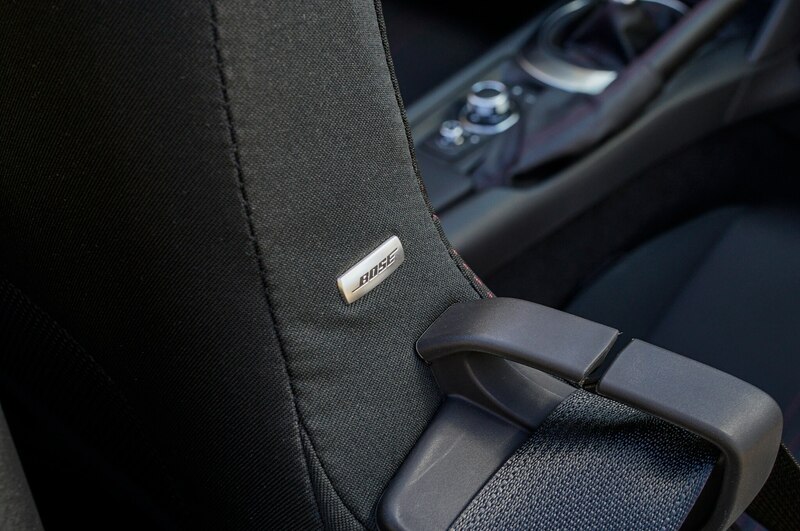 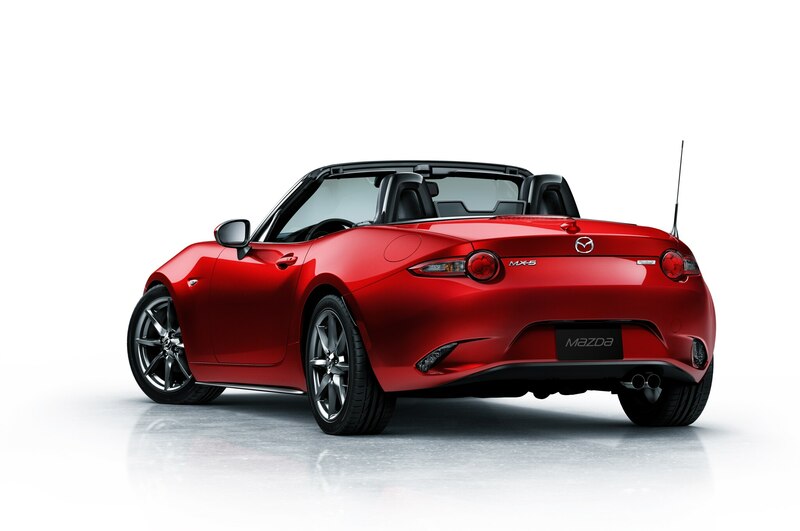 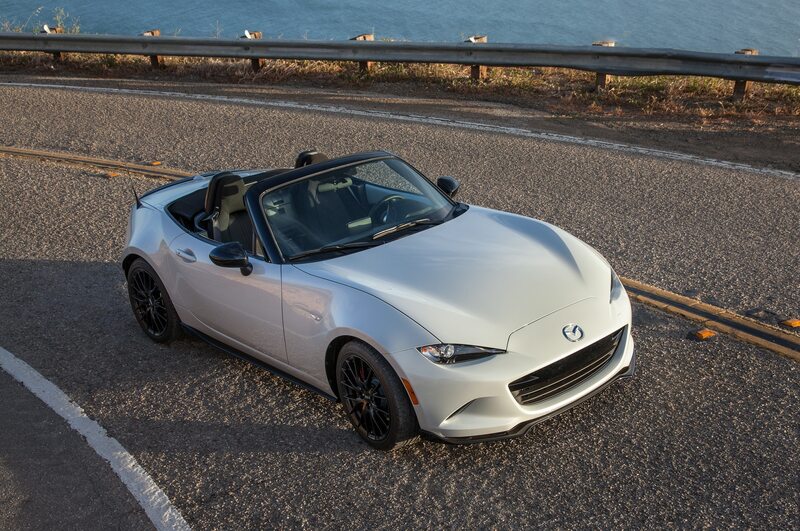 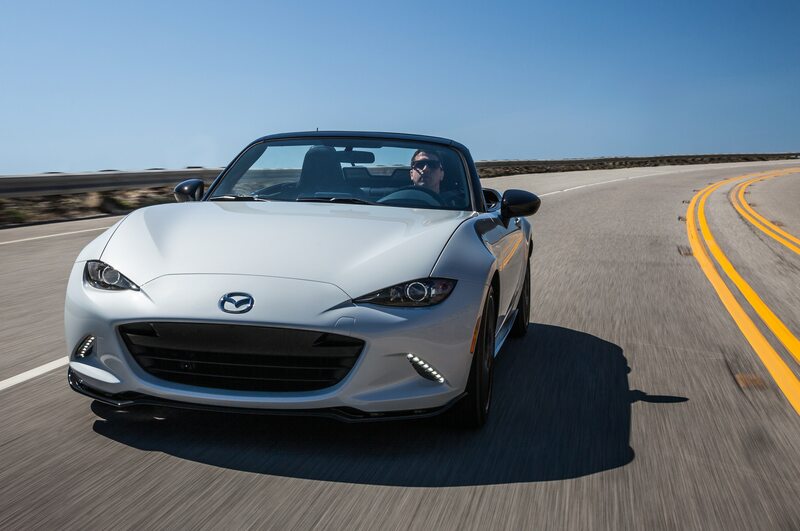 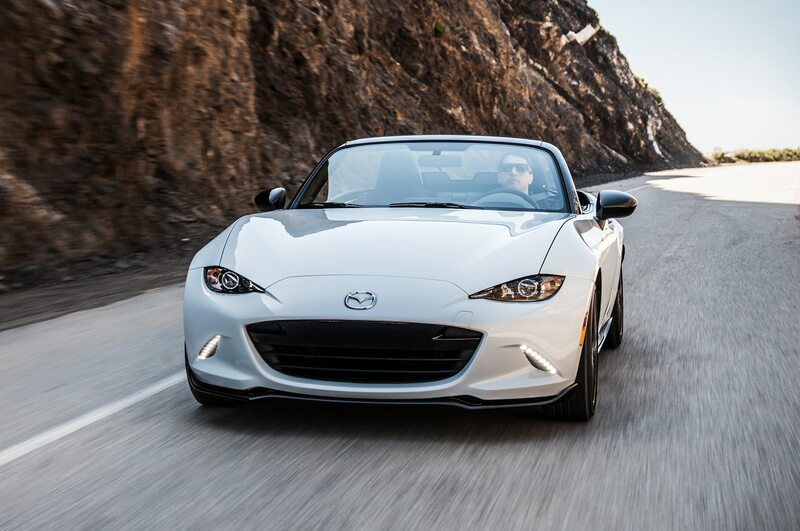 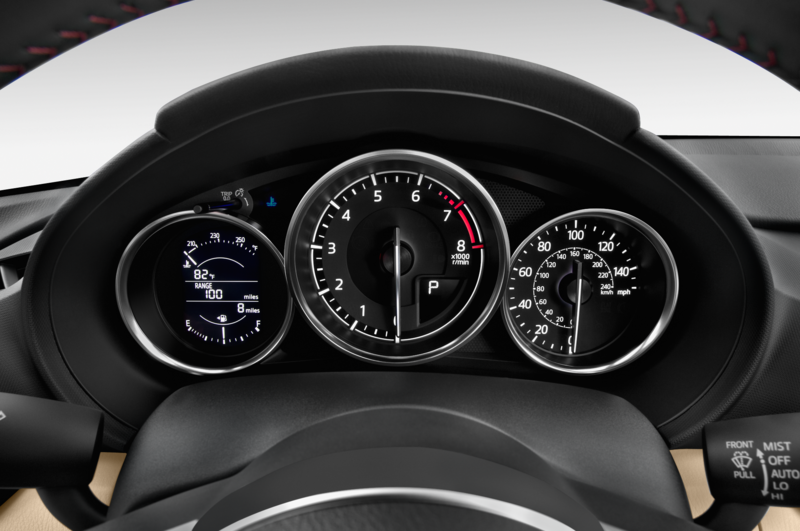 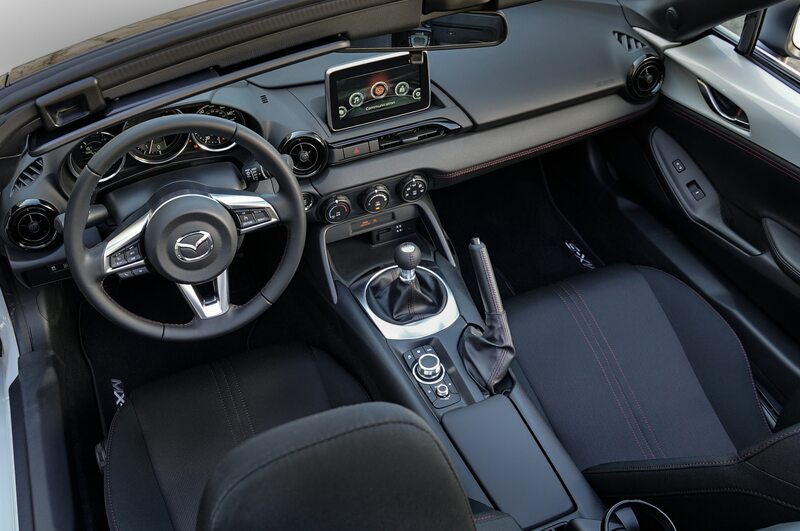 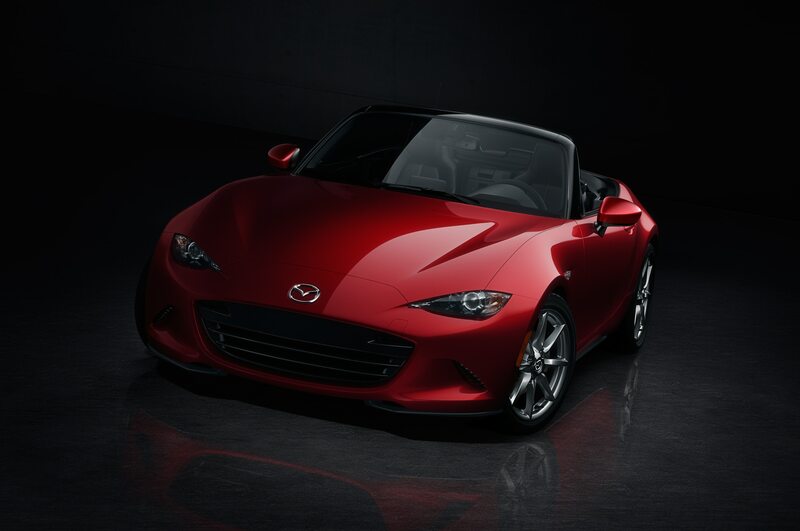 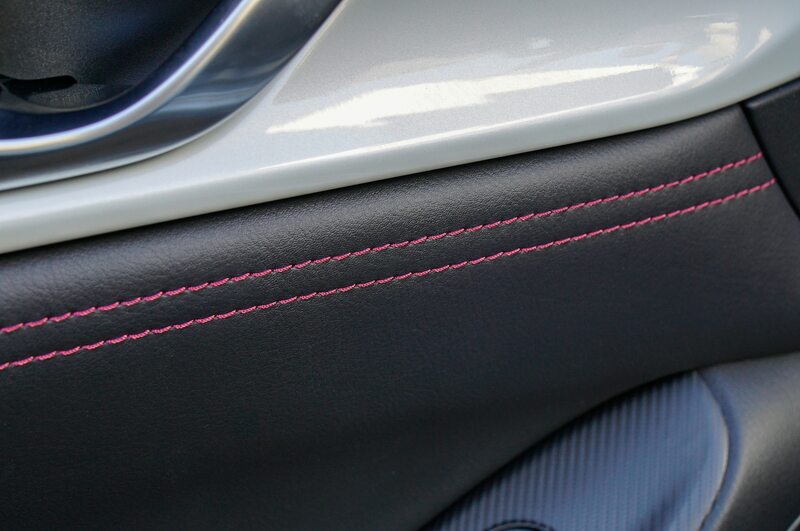 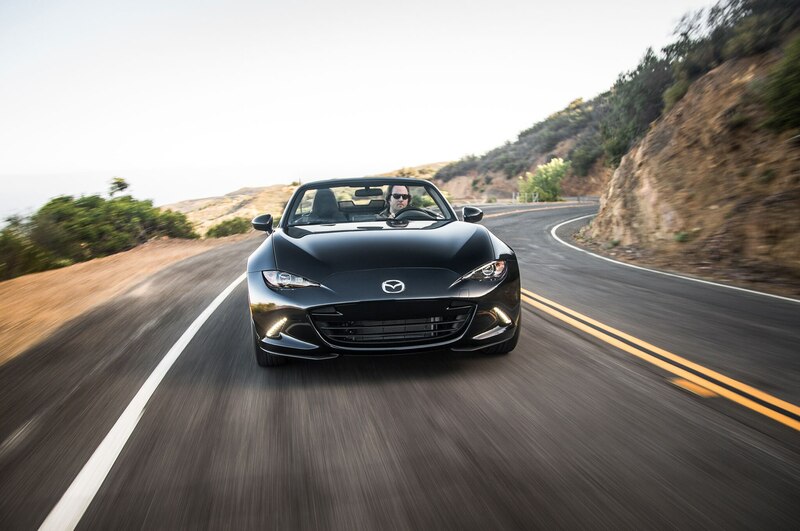 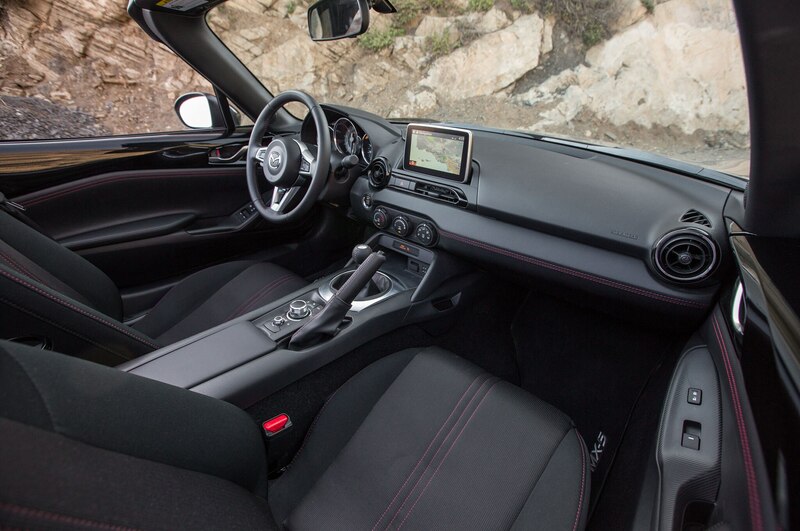 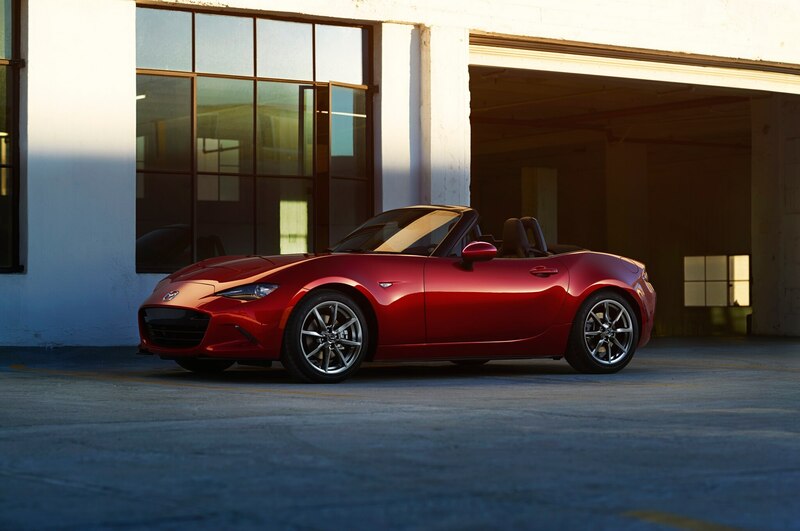 The 2016 Mazda MX-5 Miata’s essential controls are improved in feel. 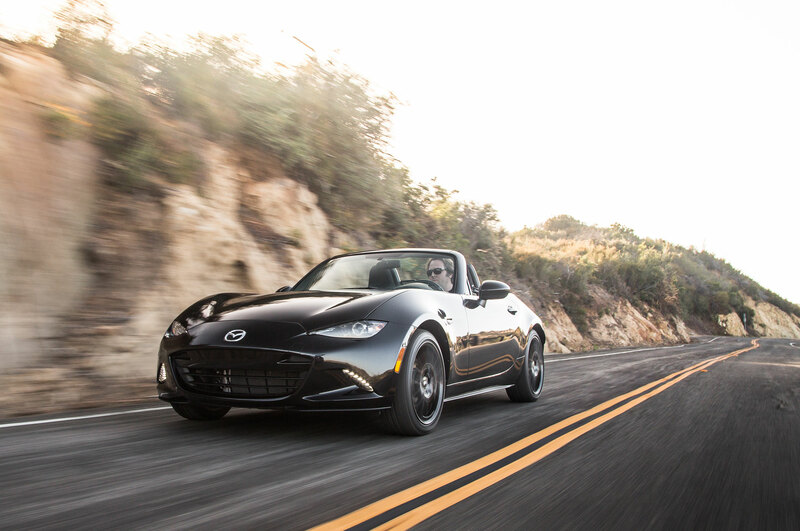 The steering is still quick and sharp but feels more refined — less jerky. 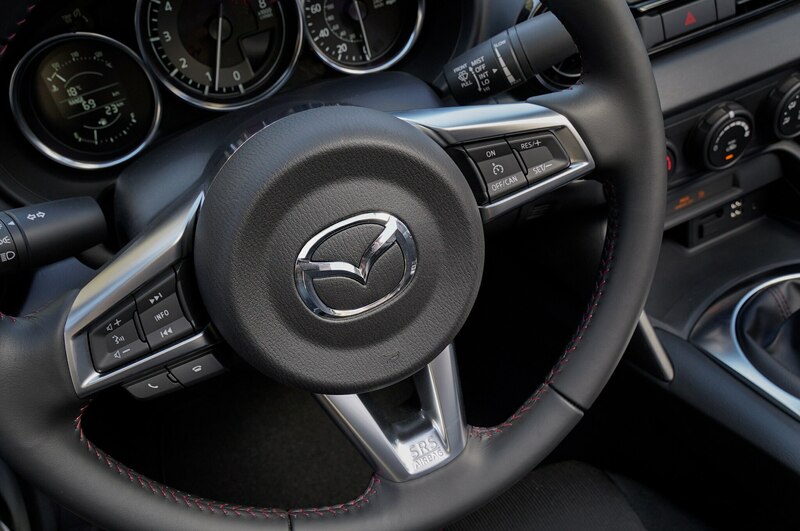 I wasn’t sure how Mazda could improve on what is arguably the best shifter on the market, but throws are just as short and precise as before and far smoother — less notchy. 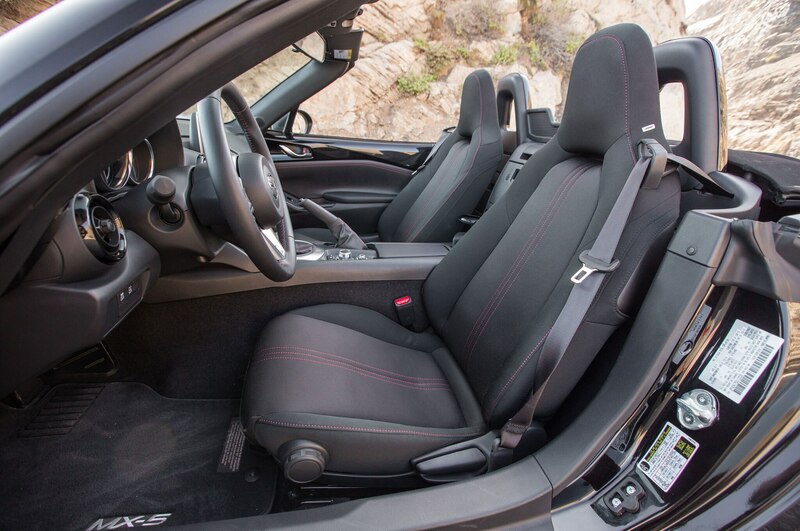 The footwell feels roomier, and the throttle/brake relationship is spaced perfectly for effortless rev-matching. 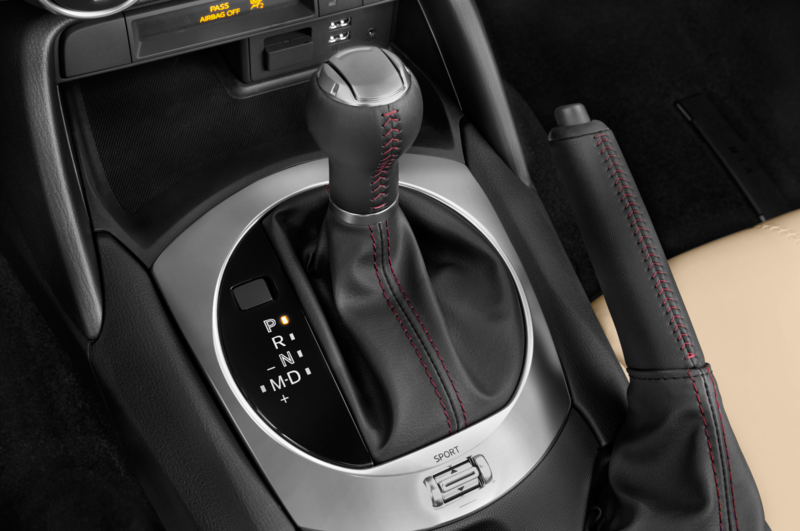 The brake pedal feels a bit strange at first, demanding more effort before effectively slowing the car. 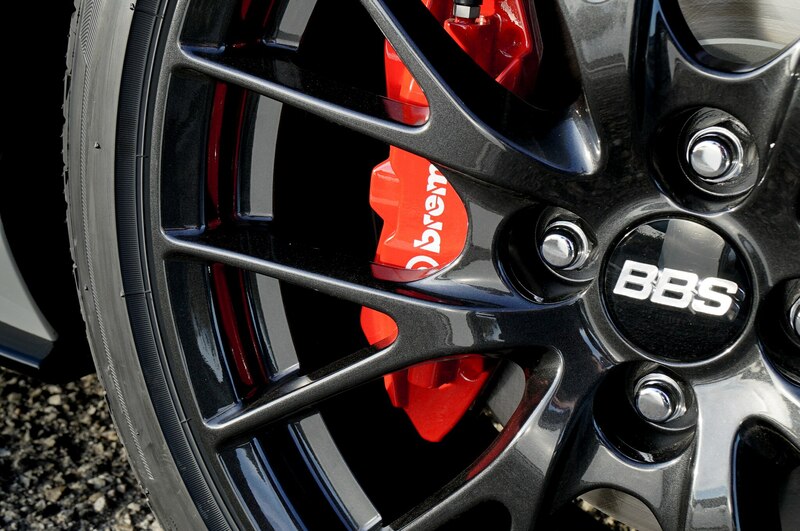 That’s a component of the optional Brembo brake package. 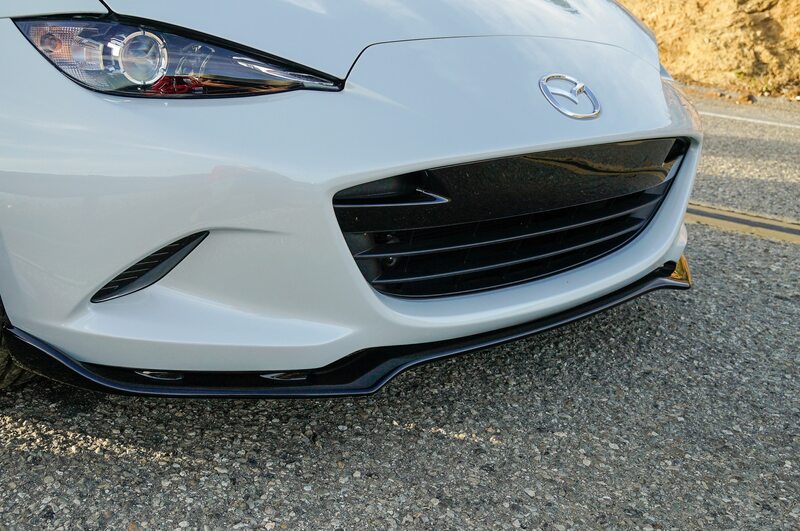 The larger front pads dissipate heat more effectively during fast road or track use, but they’re also less grabby initially for better modulation when being used hard. 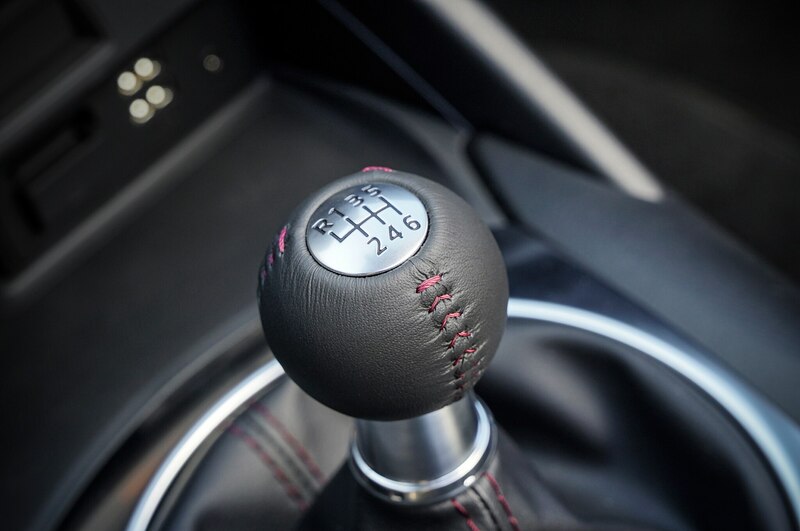 Strange in rush hour, perfect in other situations as I later discover. 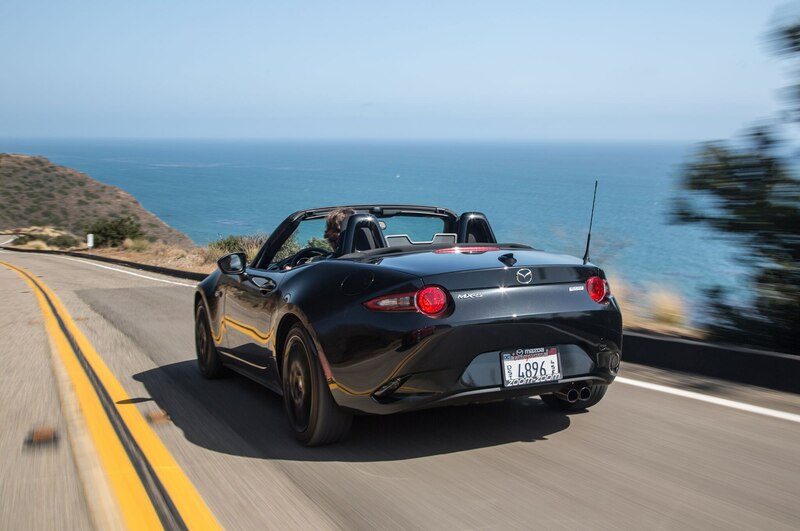 An hour or so passes and I’ve finally ditched I-405 for the meandering oceanside road that is Pacific Coast Highway. 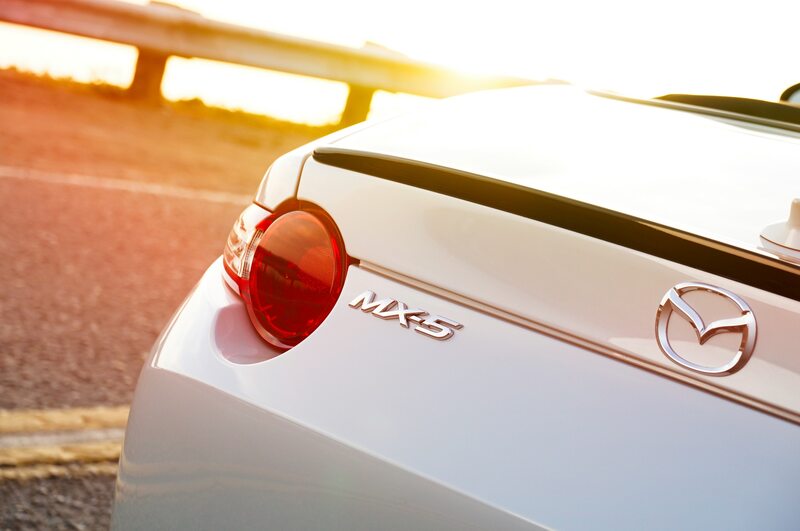 Traffic is surprisingly light as the sun climbs higher in the sky. 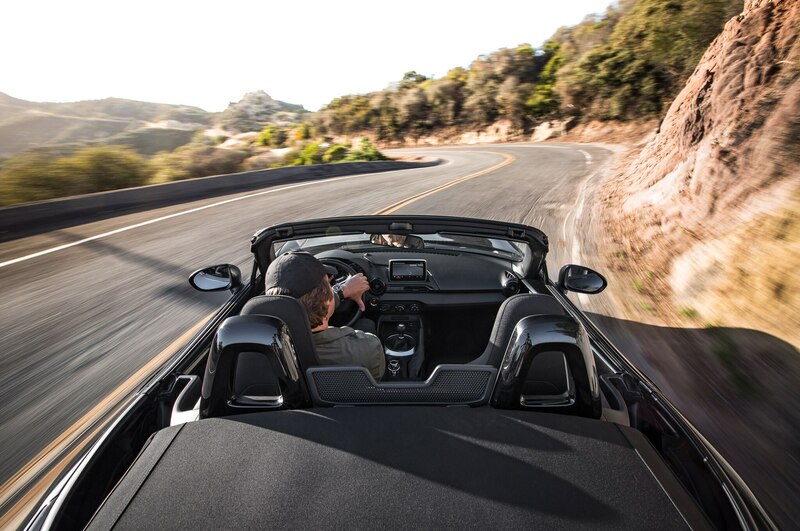 At a stoplight I can resist the temptation no longer and pull the convertible top’s release handle. 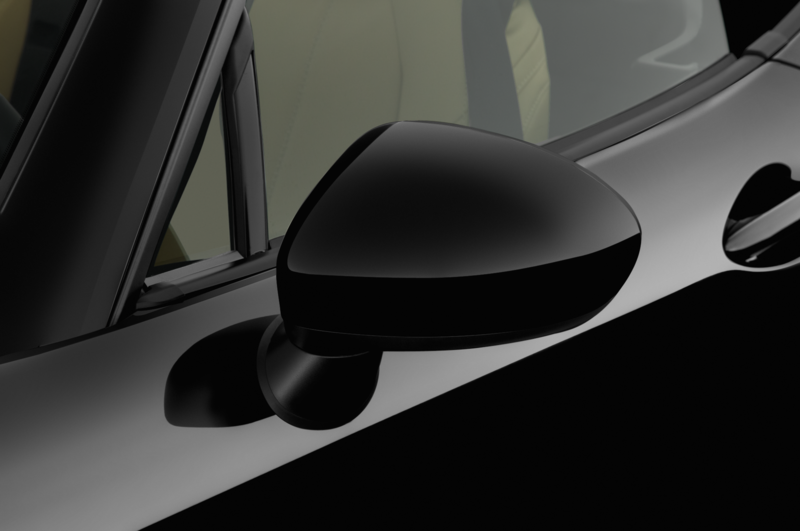 The windows automatically drop and I shove the top into its stowed position. 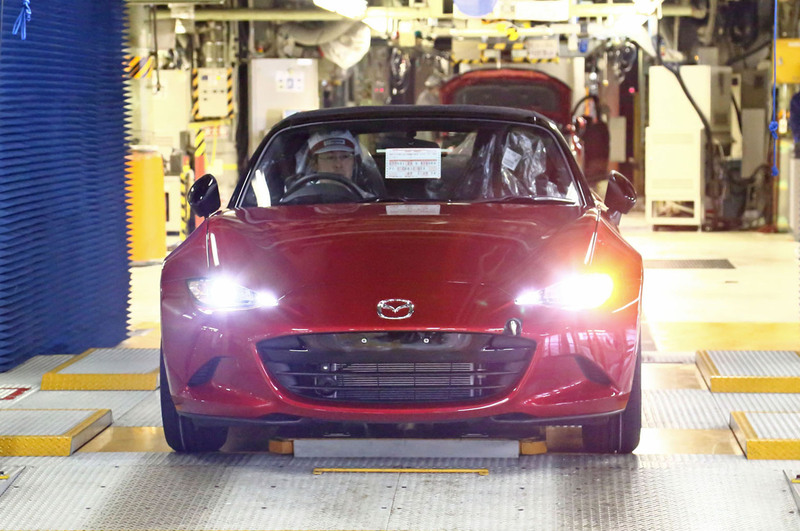 The whole operation takes maybe 5 seconds. 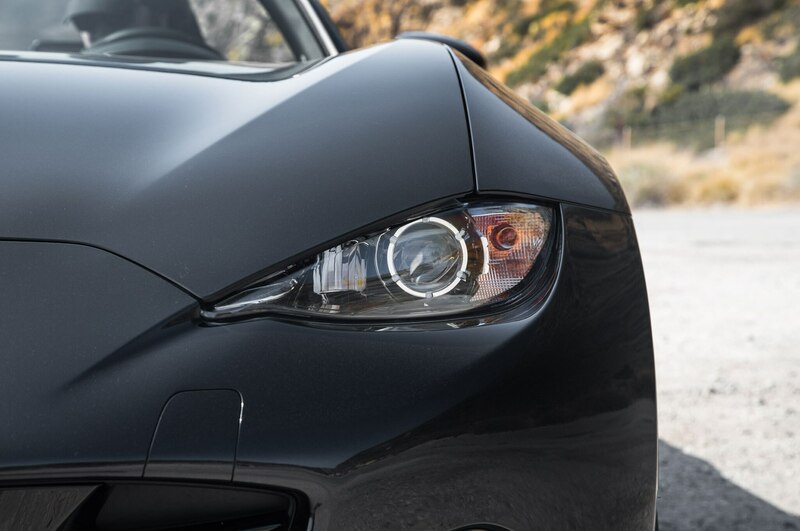 The light turns green. 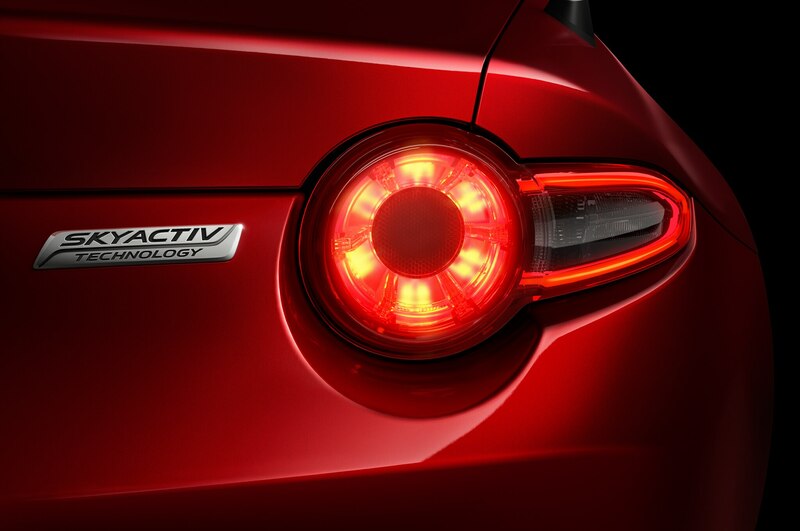 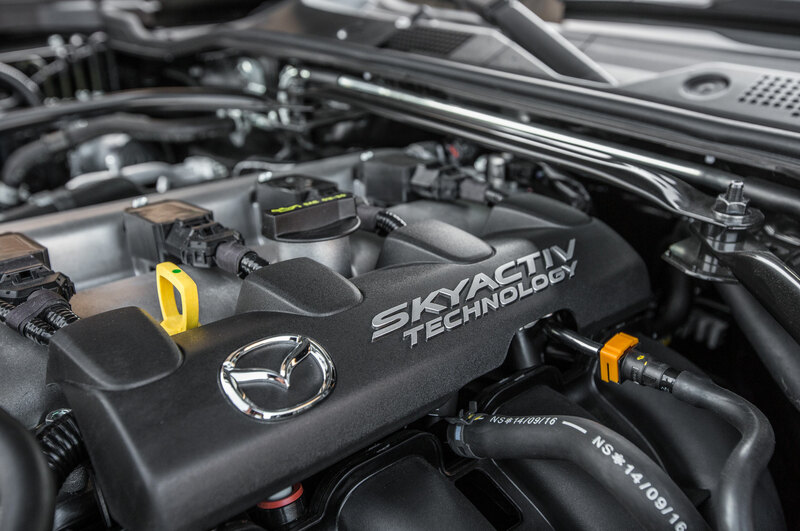 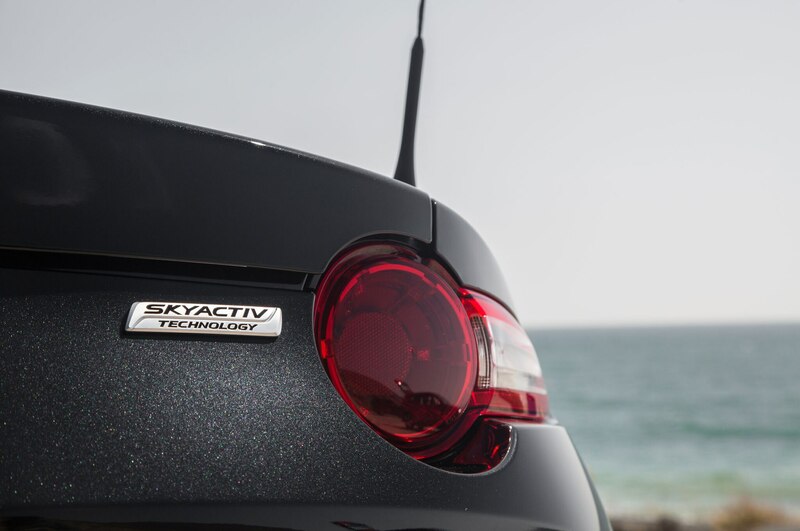 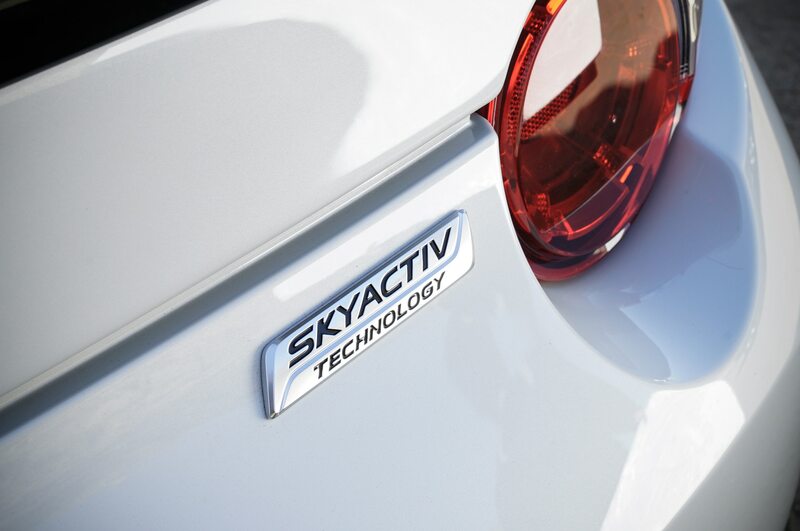 I accelerate away, the new 2.0-liter Skyactiv-G engine’s fruity exhaust note sounding even stronger without a layer of fabric between it and my ears. 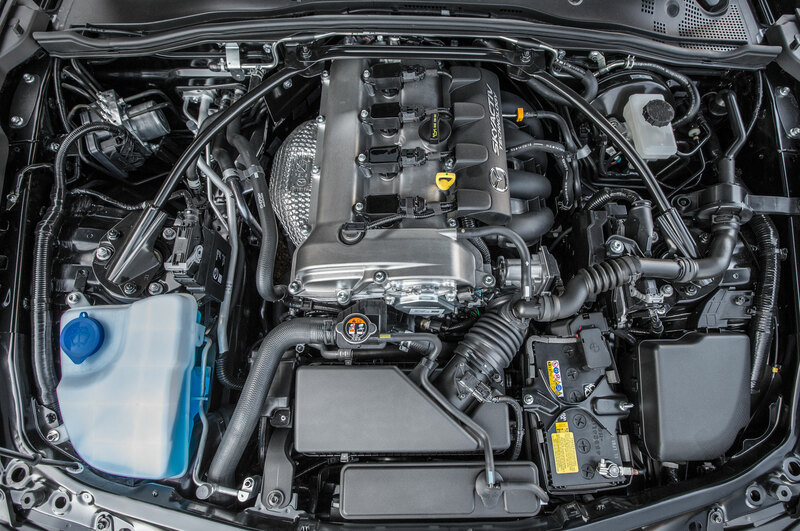 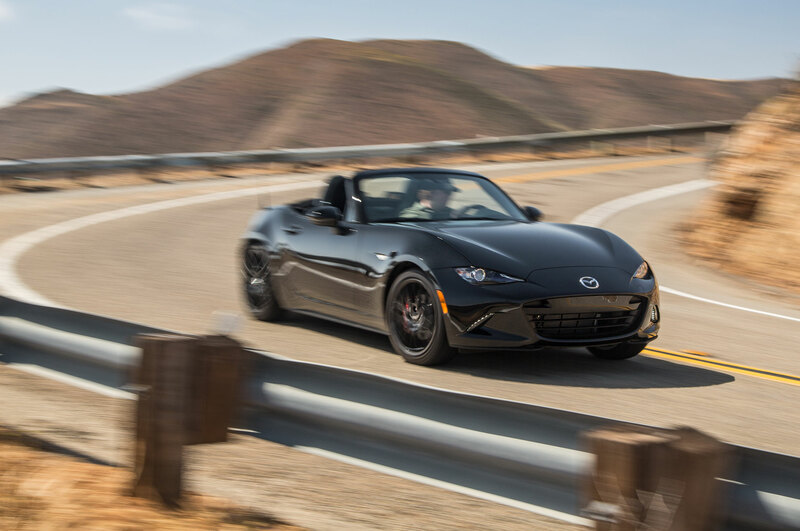 The engine’s improved torque delivery is noticeable, especially in the mid-range, and the throttle gives more linear response across its travel. 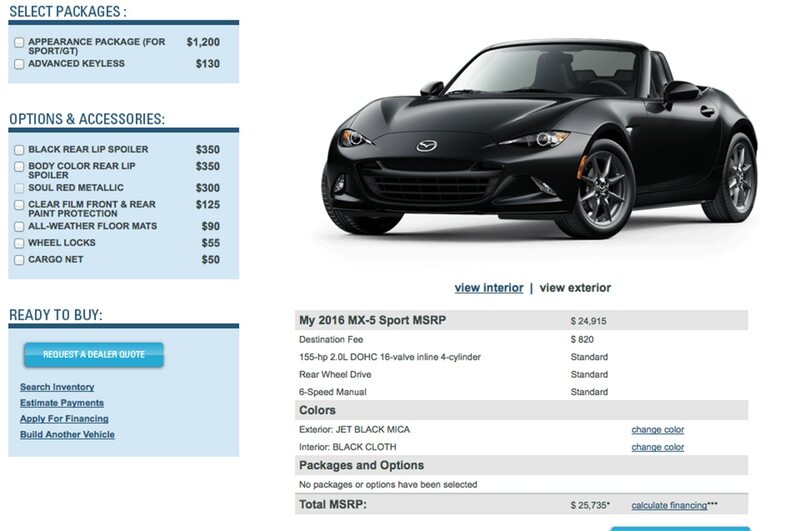 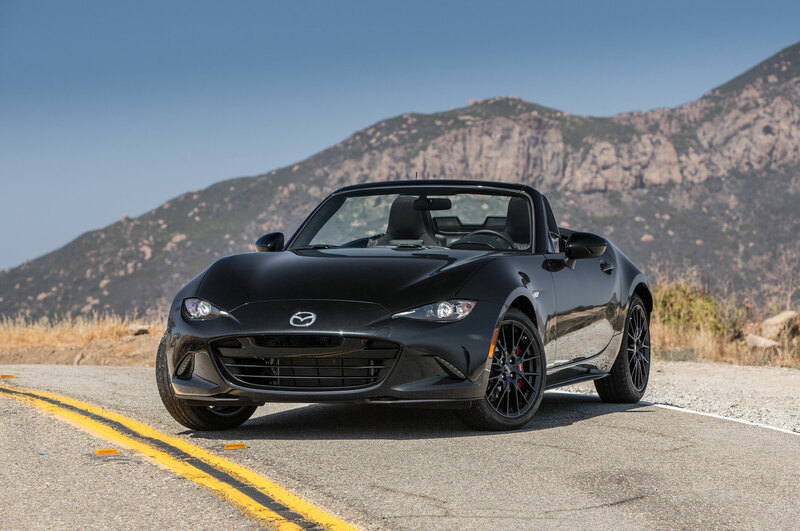 This particular 2016 Mazda MX-5 Miata is of Club spec, which means lots of go-fast goodies that you won’t be able to get on any other trim level. 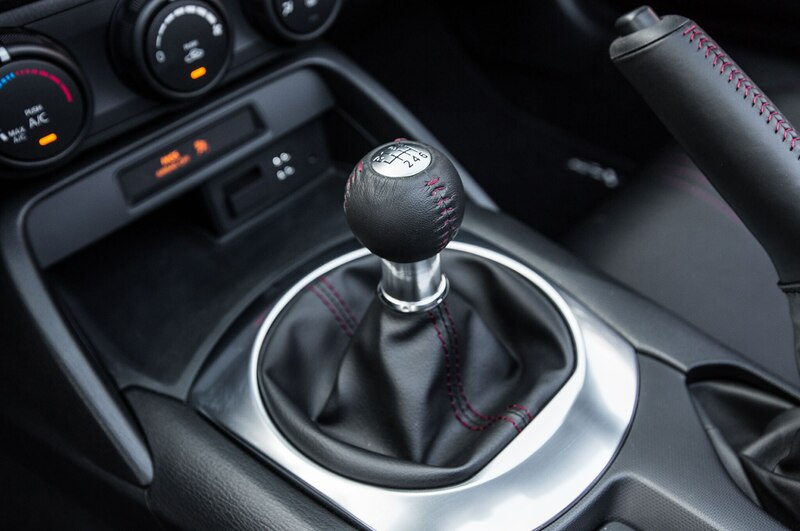 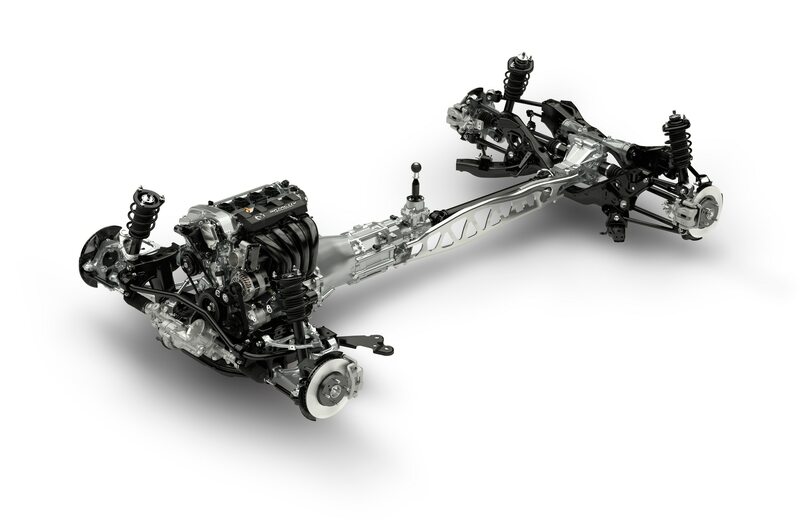 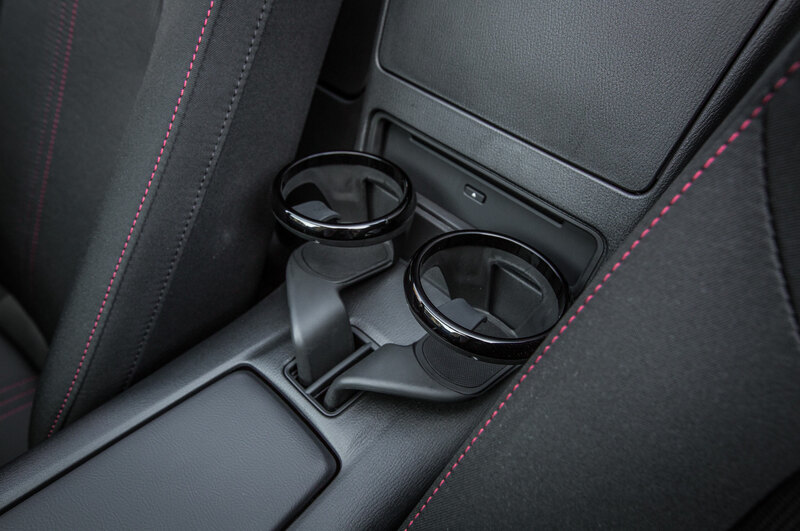 Bilstein dampers with stiffer springs, a shock tower brace, and a limited-slip differential are standard, but only available on Club versions with the manual transmission. 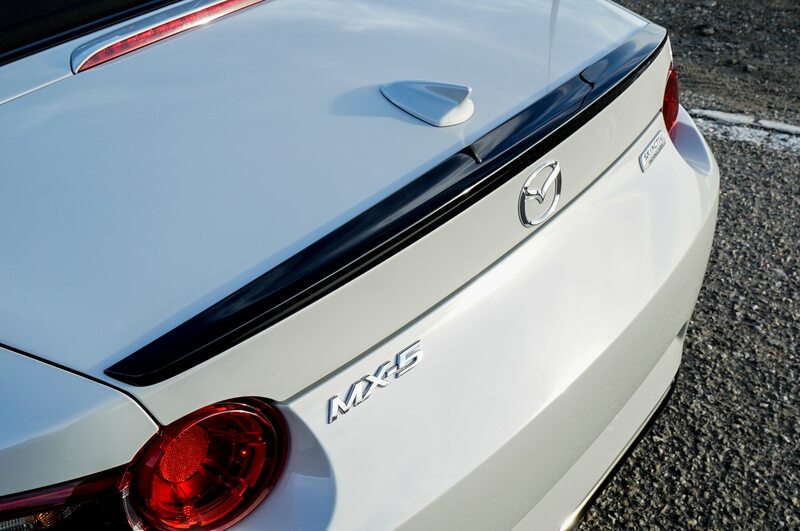 Front and rear spoilers are also part of the package though they aren’t installed on our preproduction car. 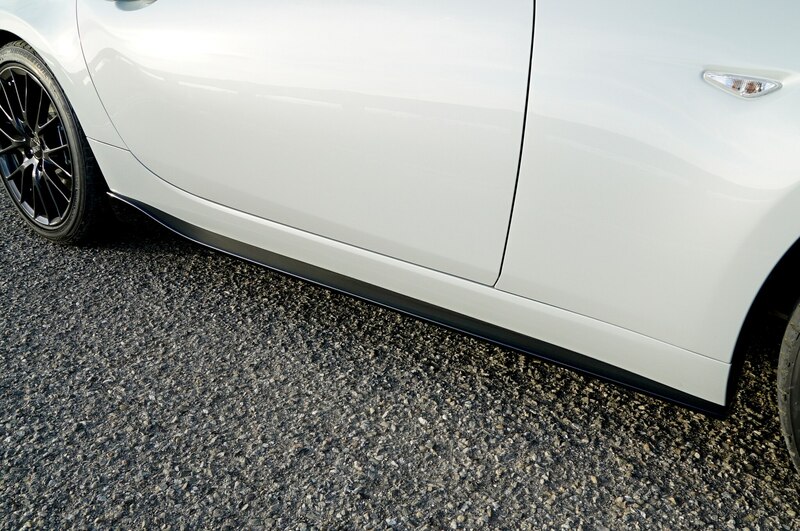 Also not installed: the rocker panel extensions and rear bumper skirt that are supposed to come with our tester’s optional Brembo/BBS package ($3,400). 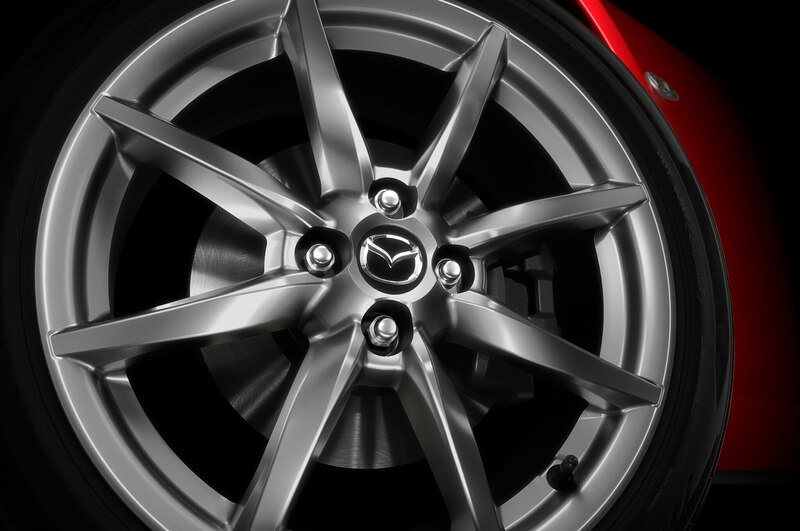 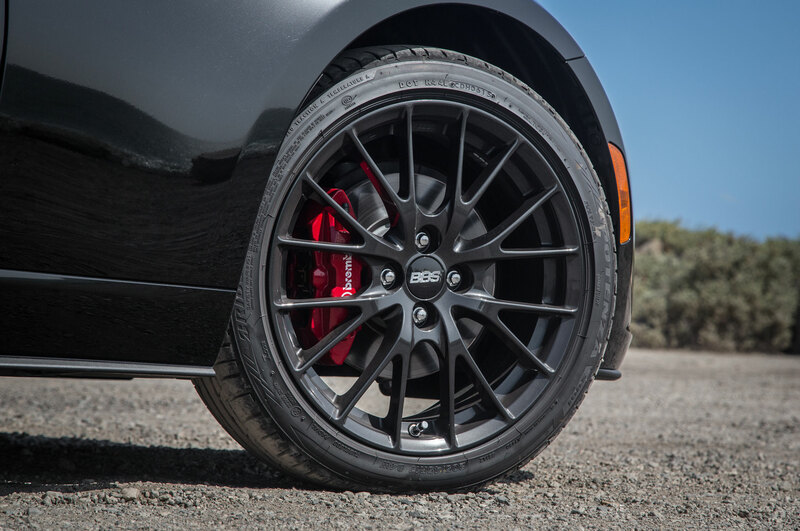 Said package also includes the aforementioned Brembo front brakes and dark-colored 17-inch BBS wheels. 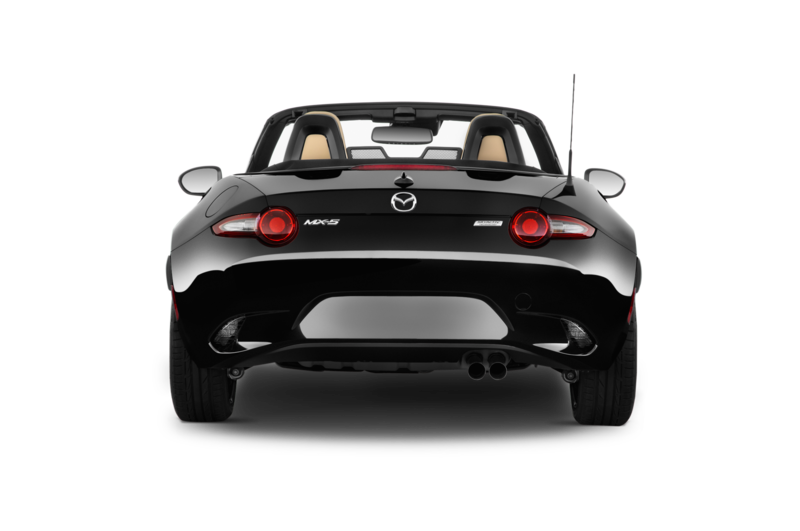 All in, the sticker price for a car identical to this one (including advanced keyless entry at $130) is $32,950. 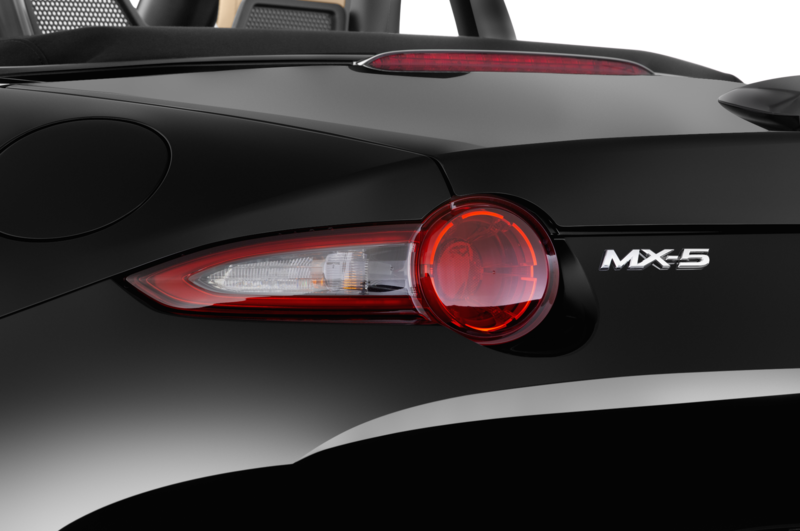 That might seem like a lot, but it’s right in line with a moderately equipped Scion FRS or Subaru BRZ, the MX-5’s most obvious competitors despite their fixed-roof, 2+2 design. 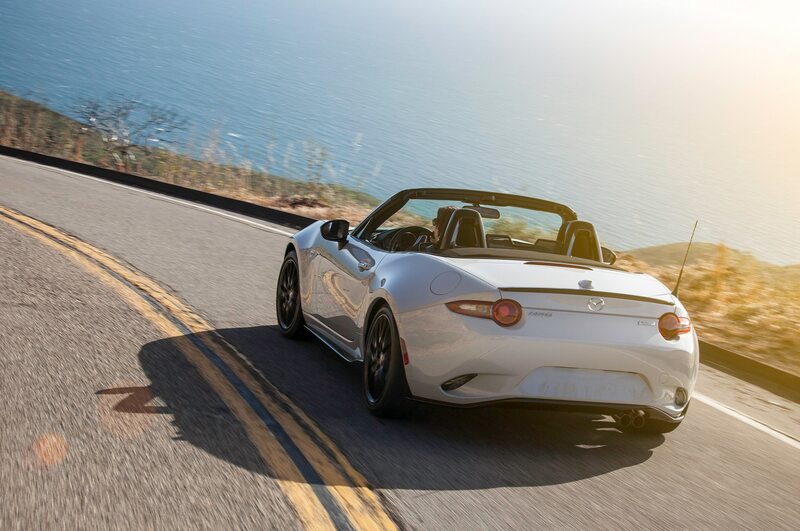 Turning off PCH onto the notoriously twisty Decker Canyon Road, all those sporty bits begin to work in unison. 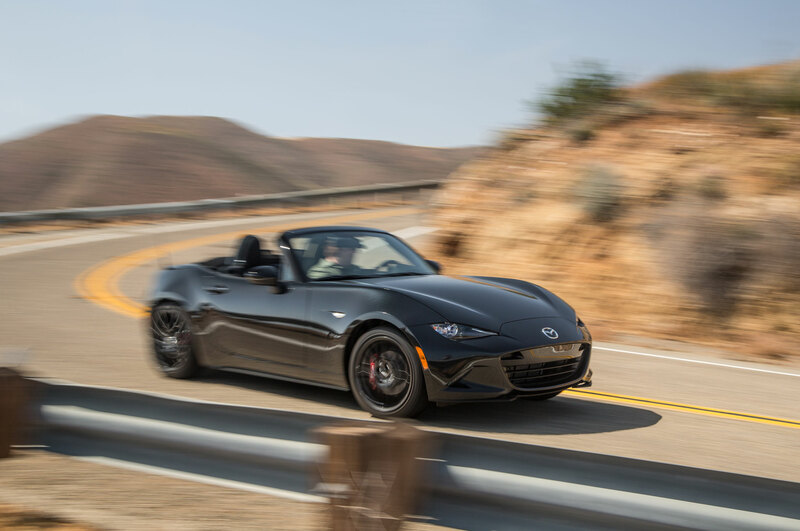 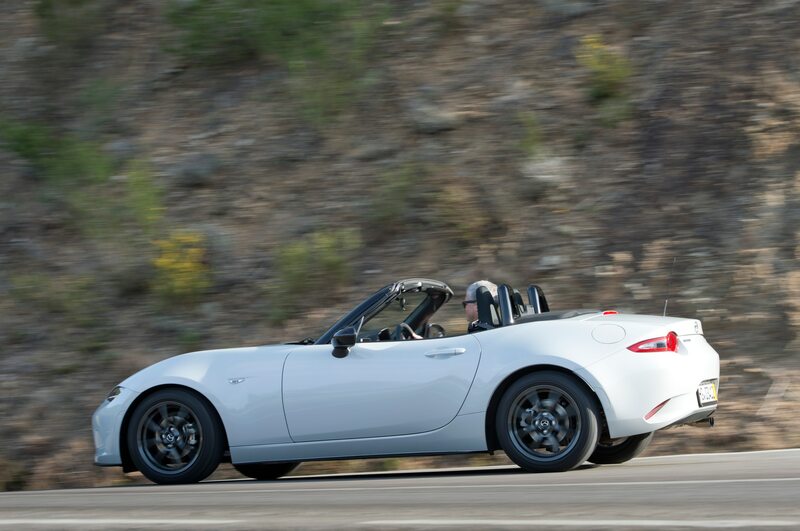 There are several tight, uphill hairpins on this early stretch of Decker; hard on the gas, then the brakes, drop a gear with a roarty throttle blip, turn in, and the Miata tucks its nose in eagerly. 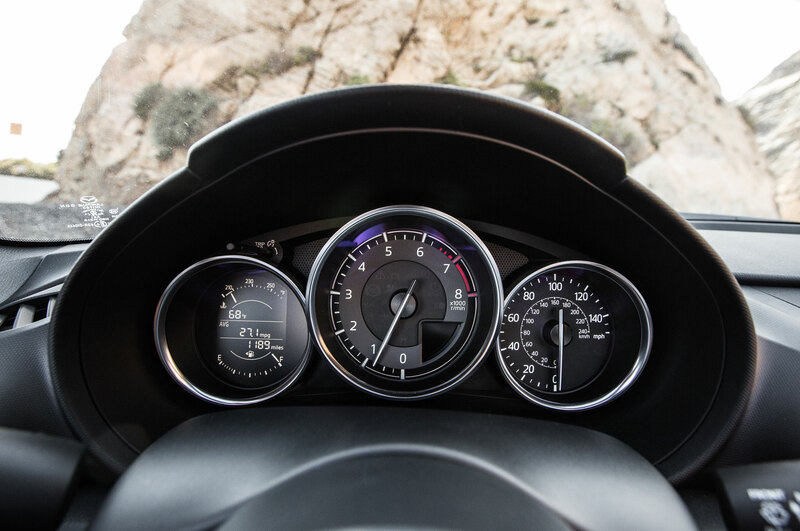 Steady throttle, find the apex, then punch the gas while keeping some steering lock and the tail begins a progressive slide. 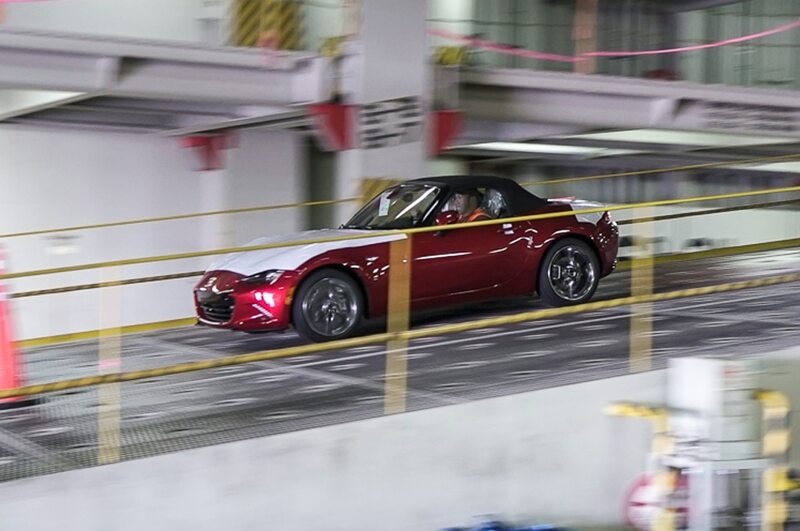 A little countersteering settles the Miata and lines it up arrow-straight toward the next bend. 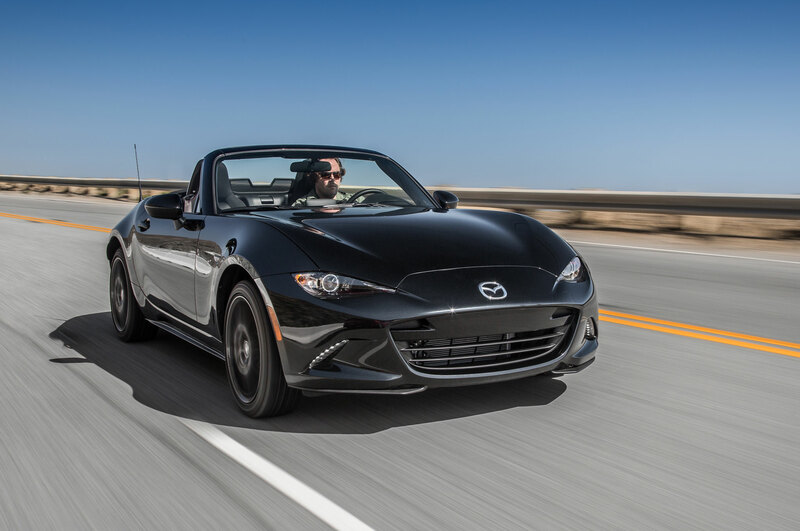 It’s easy to find rhythm driving a car like this, perfectly sized for narrow stretches of two-lane road, just enough power to keep a big, goofy grin plastered on my face. 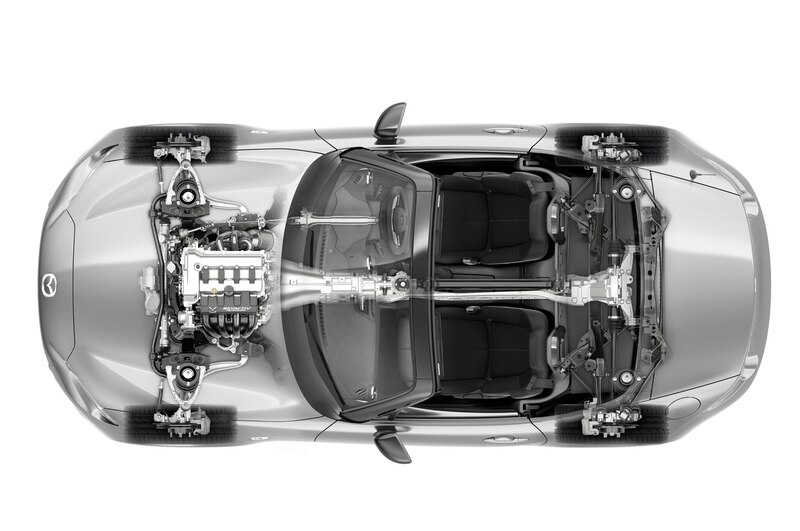 And the view out the front is mesmerizing, with the peaked fenders cresting above the tires on each side, then dropping into the low hoodline. 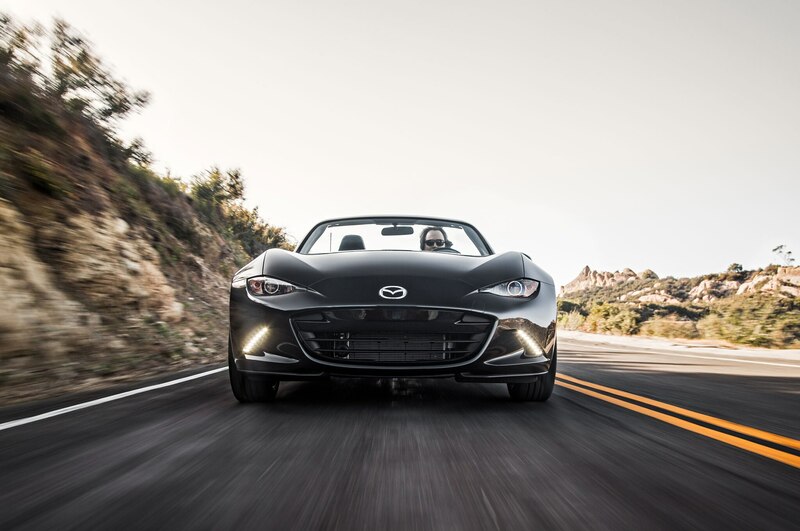 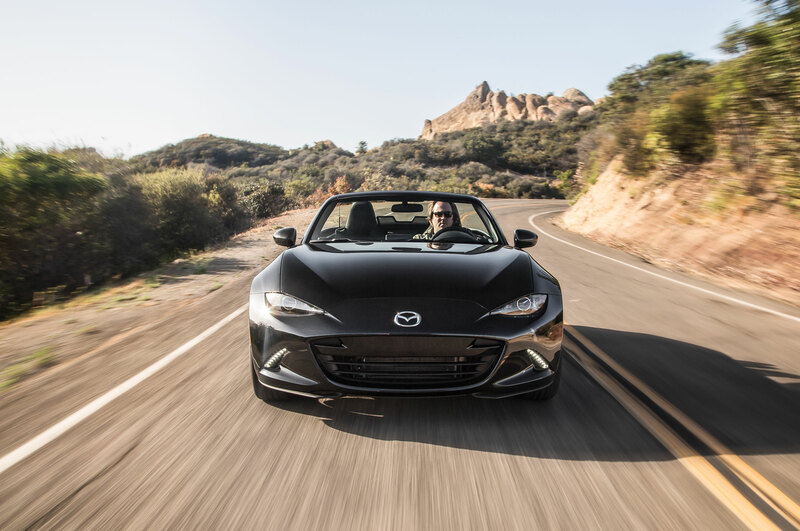 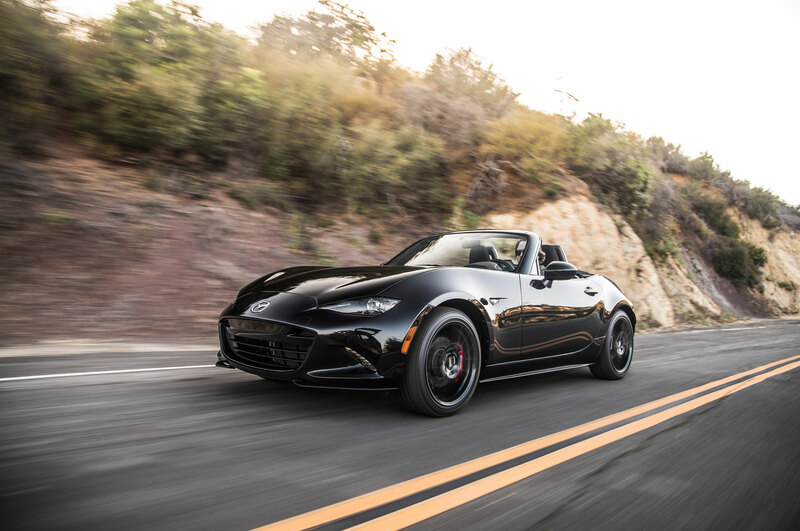 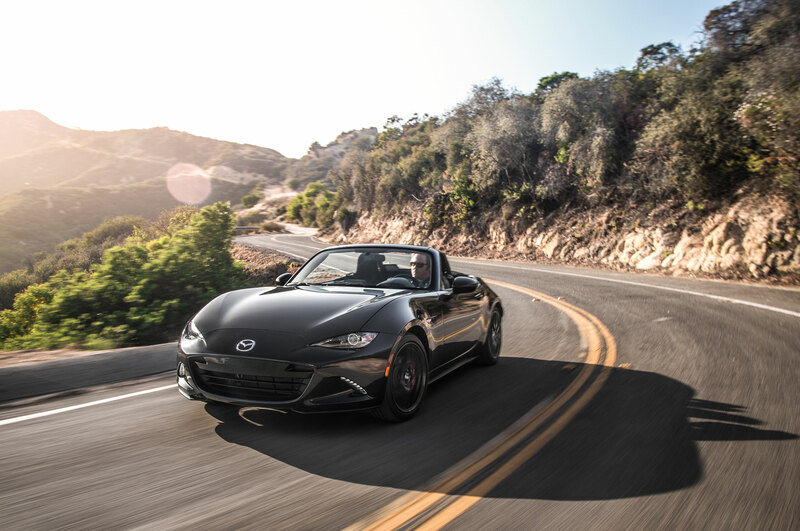 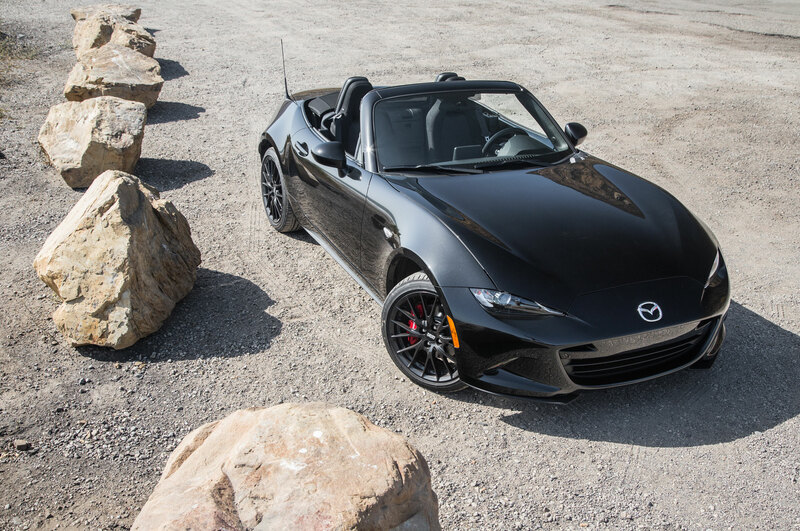 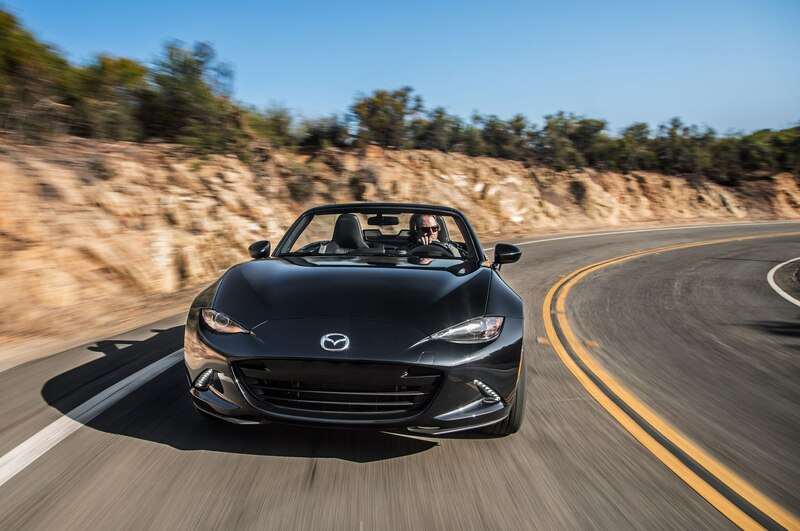 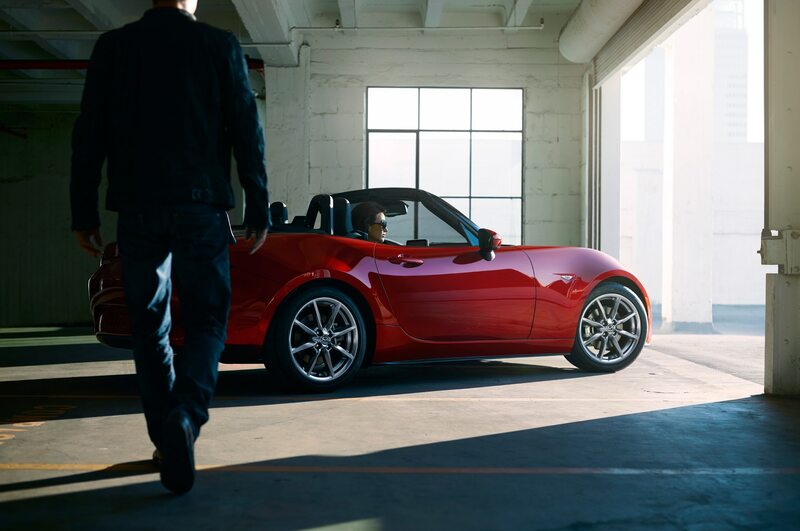 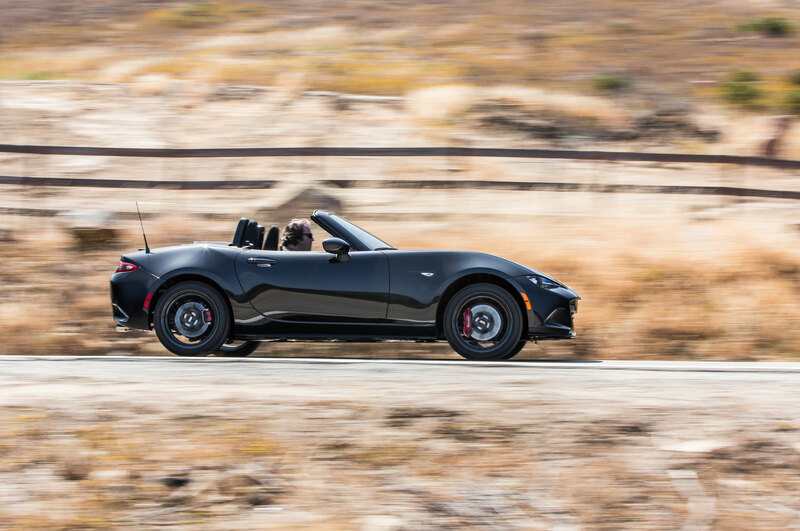 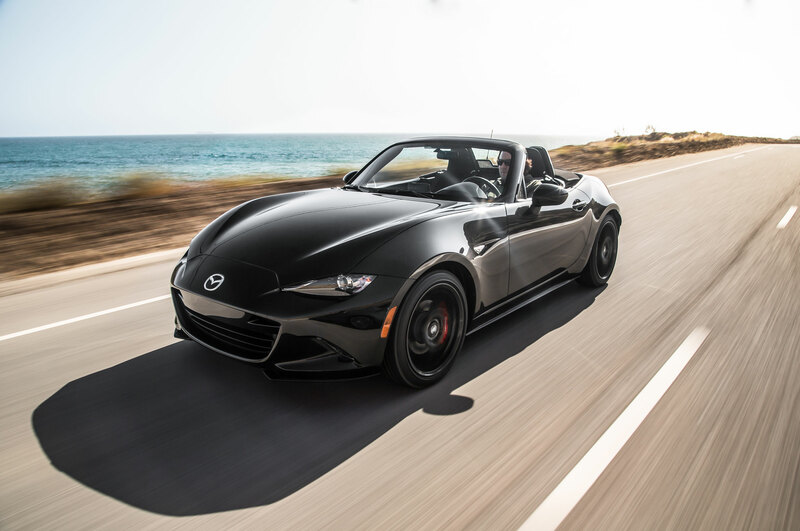 The 2016 Mazda MX-5 Miata has an overall feeling of lightness that was missing from the previous-generation car — that’s been missing since the NA ceased production, really. 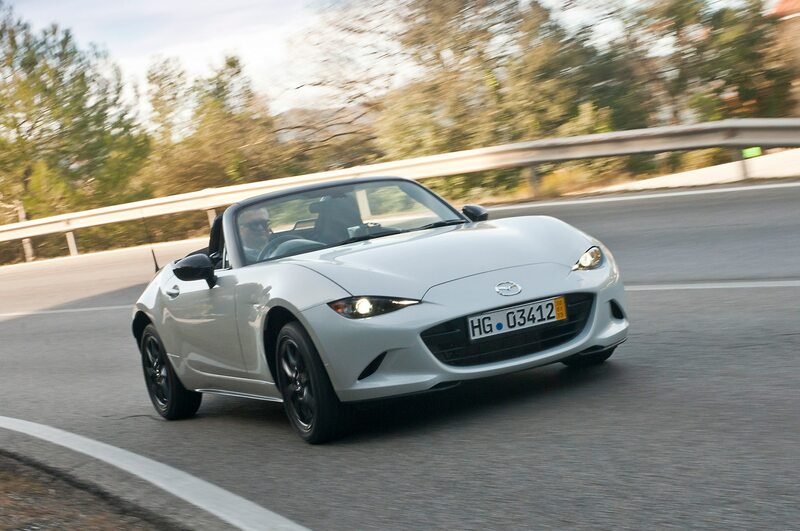 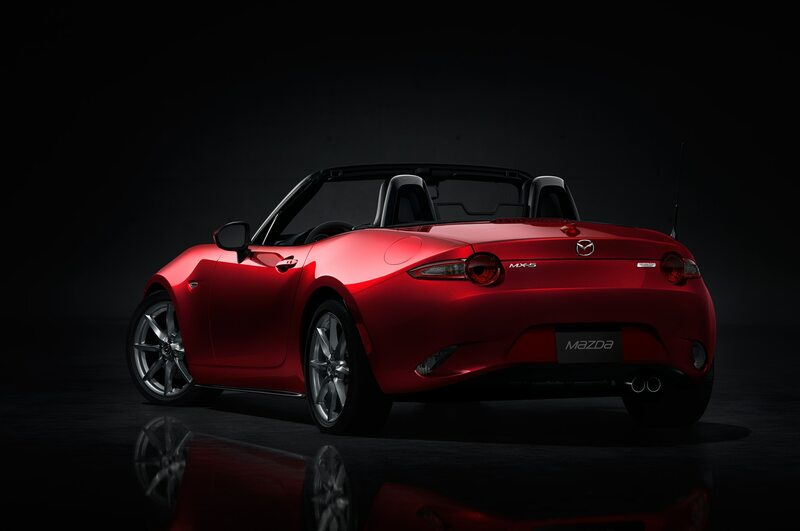 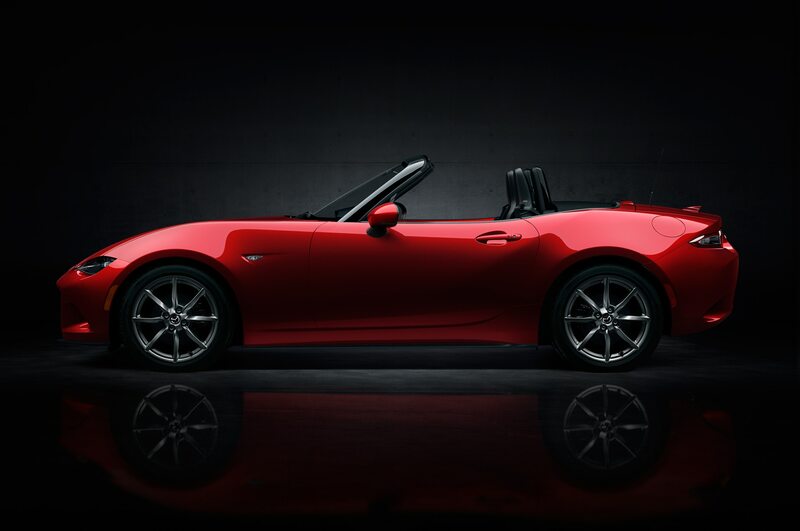 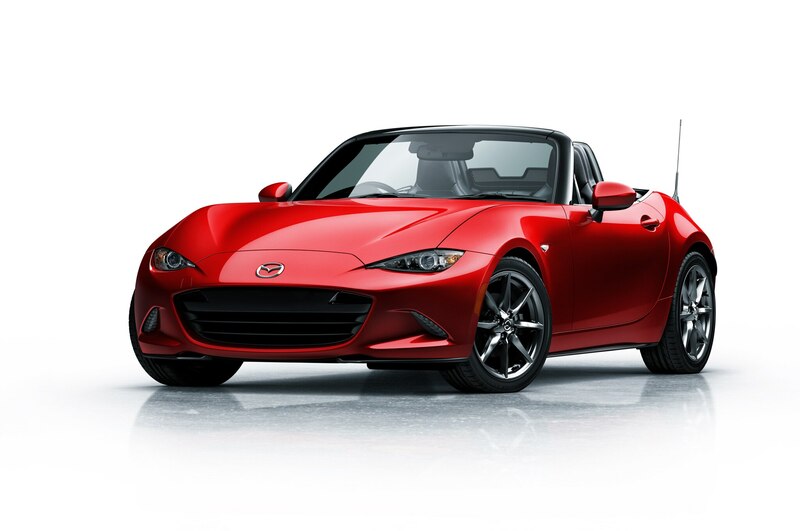 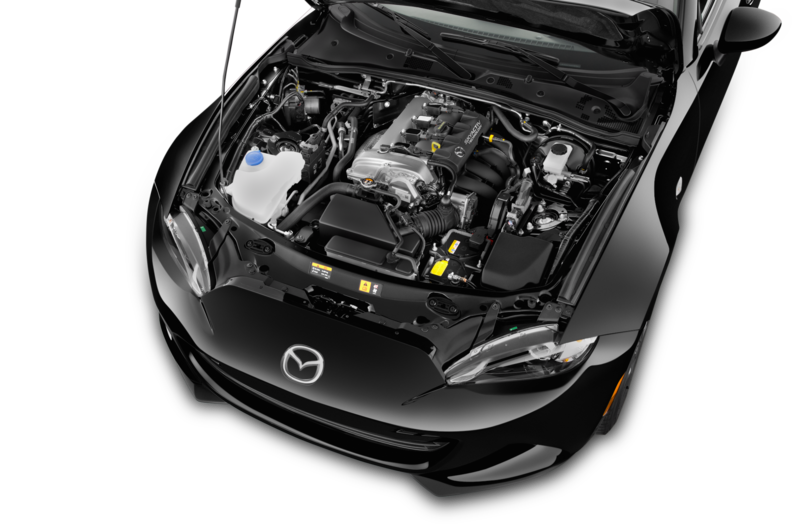 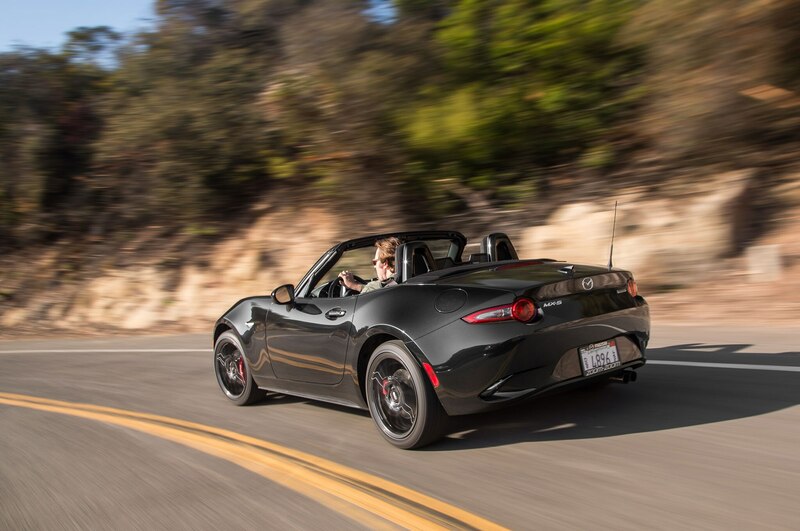 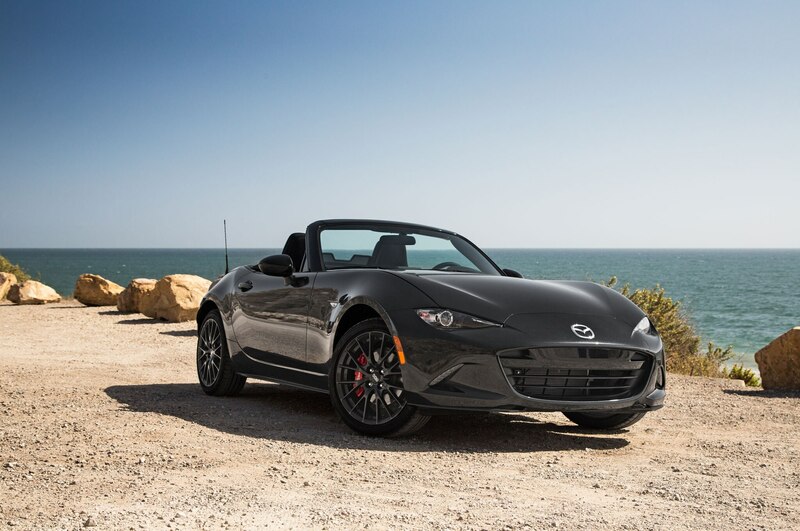 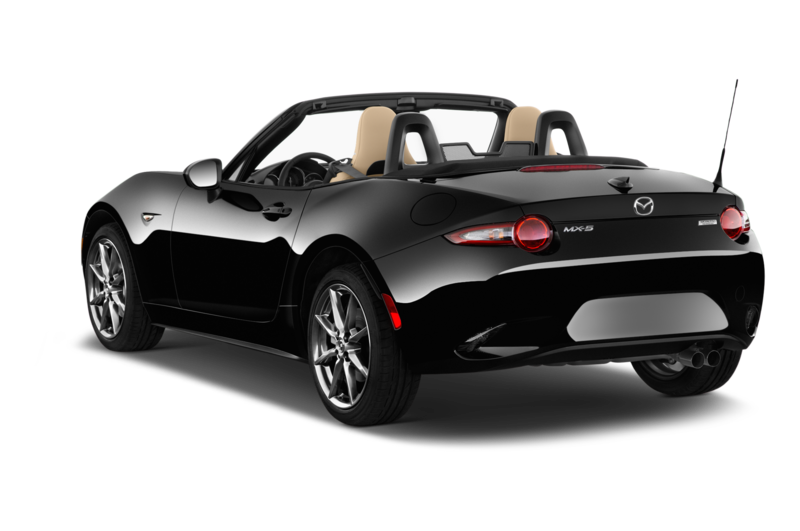 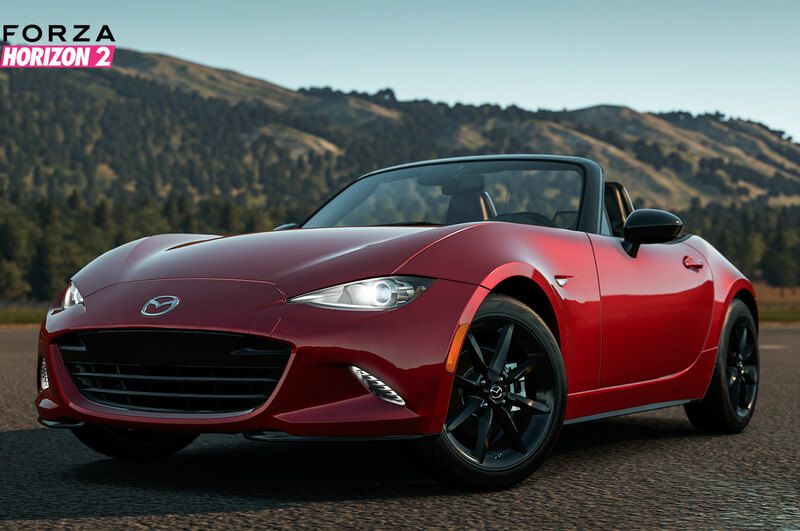 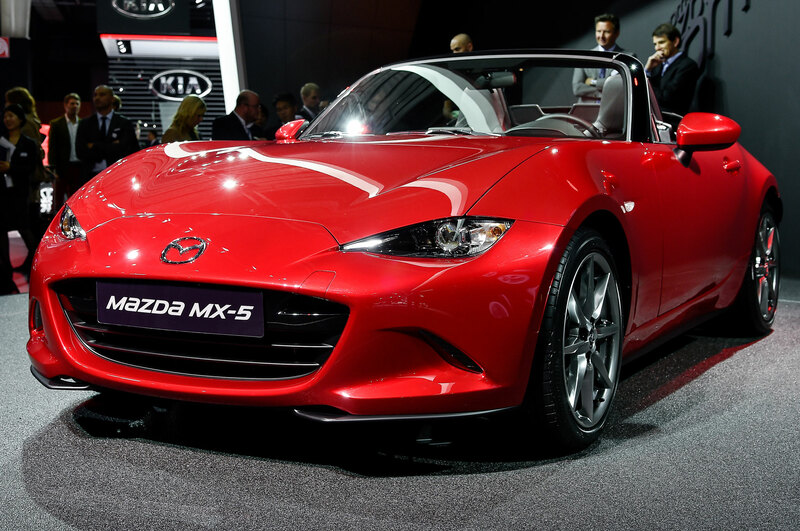 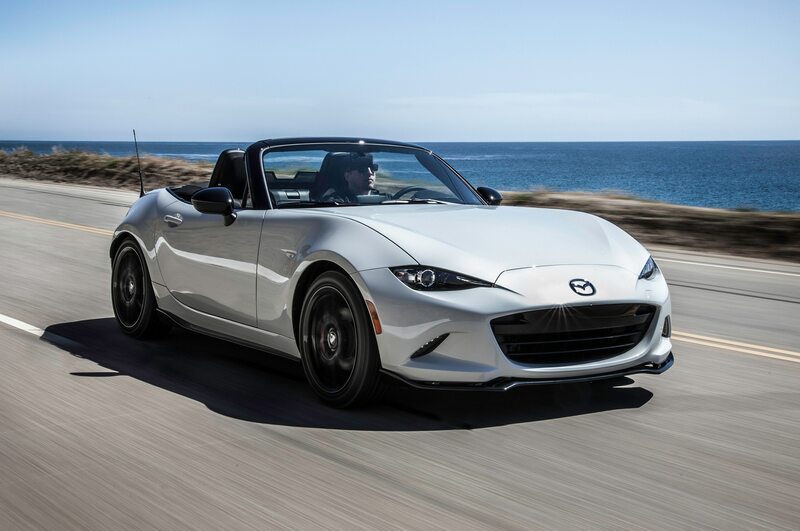 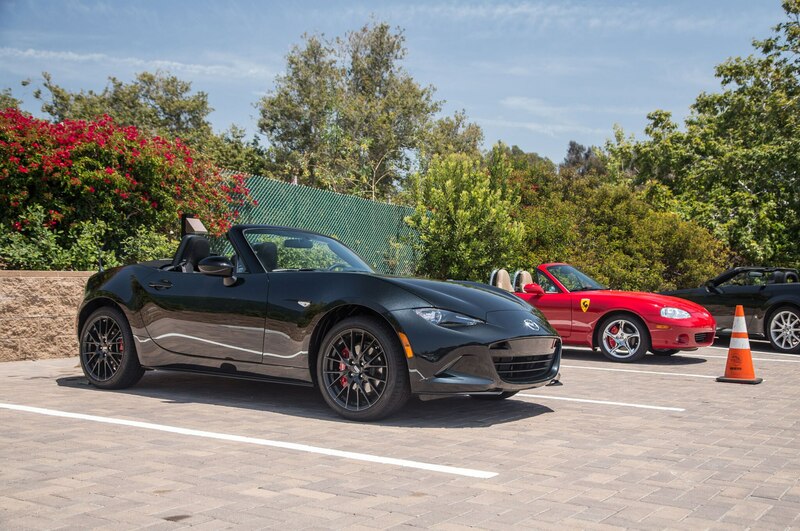 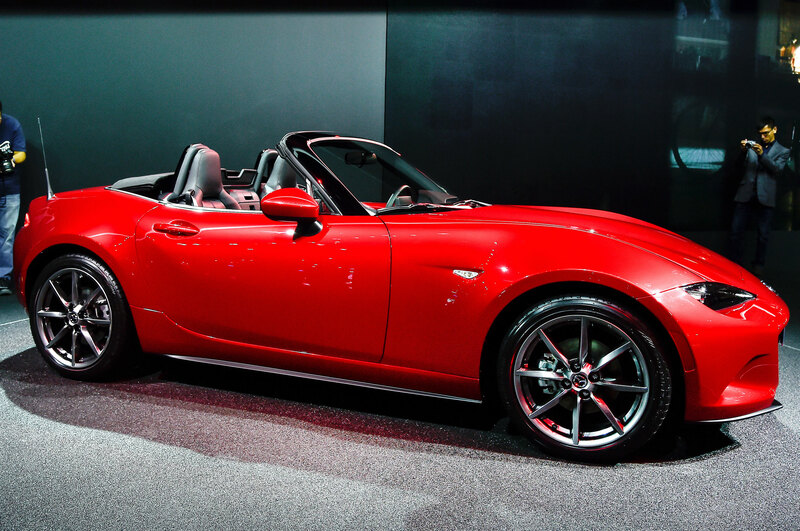 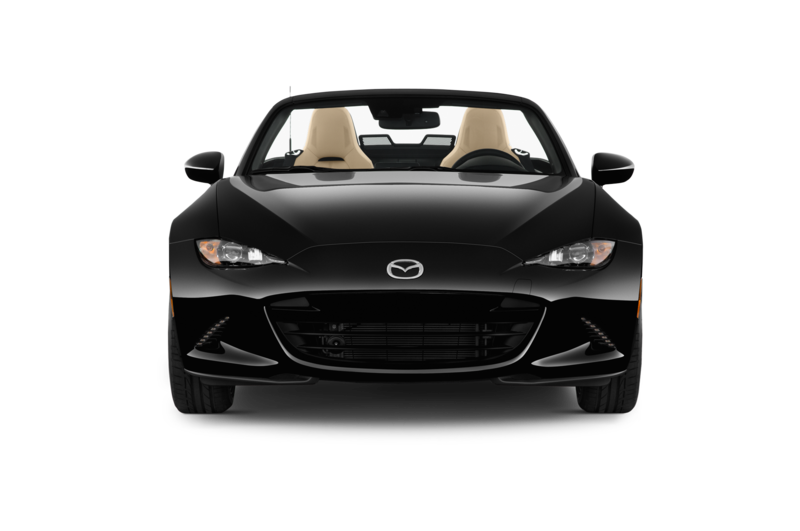 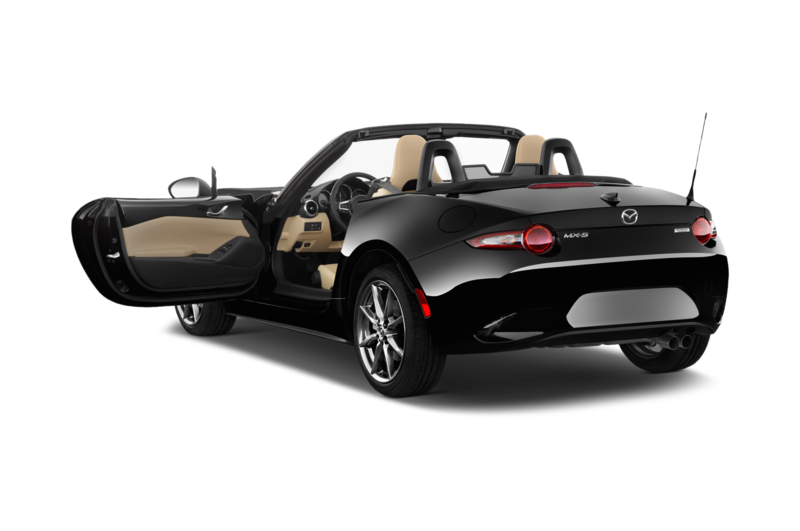 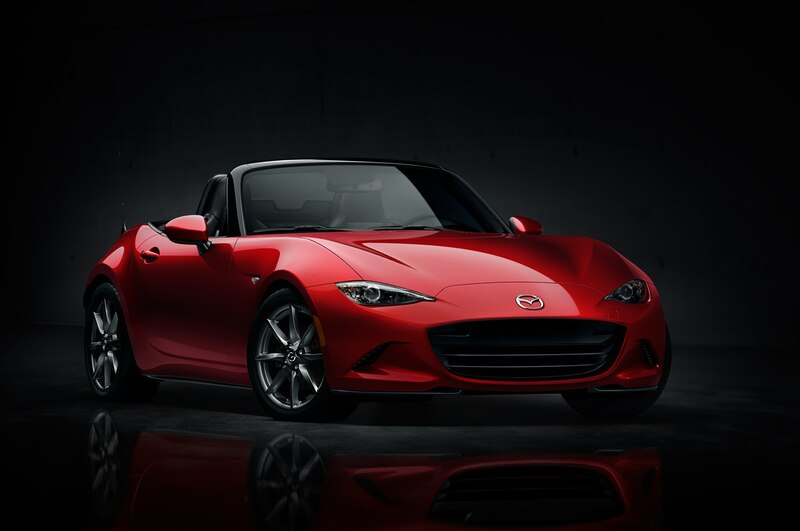 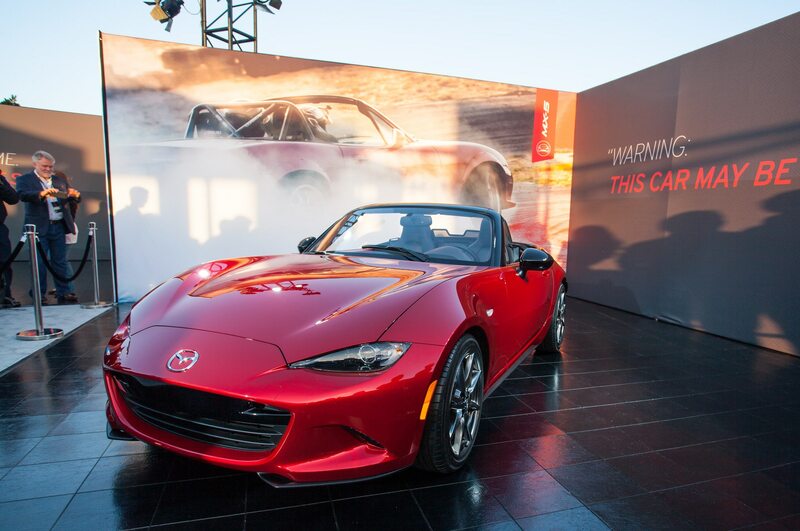 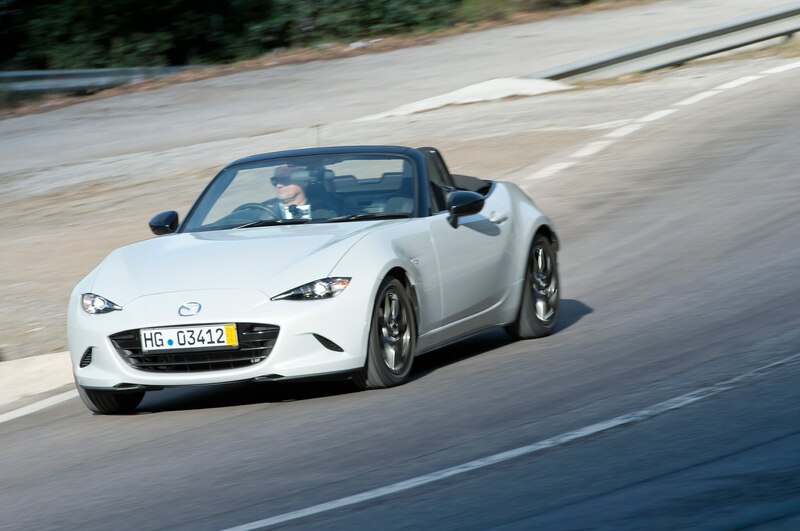 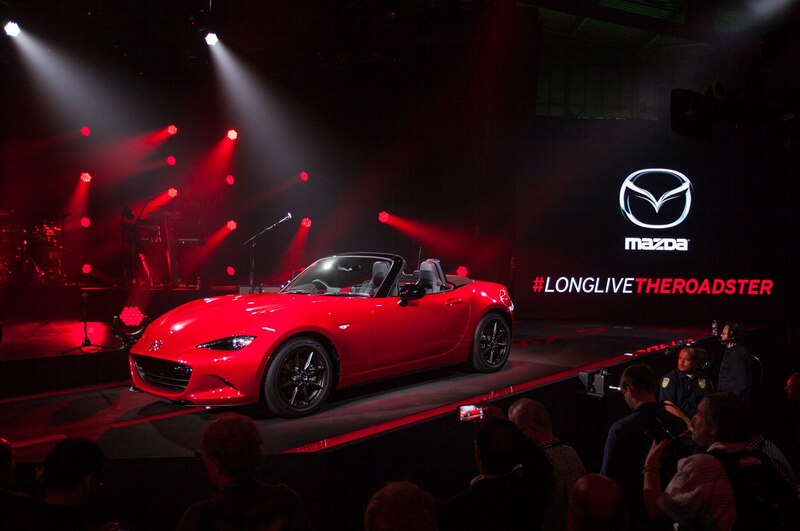 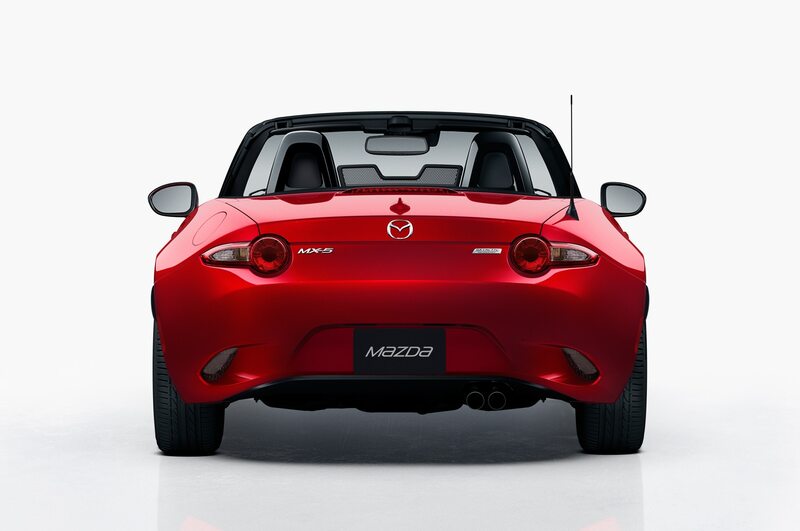 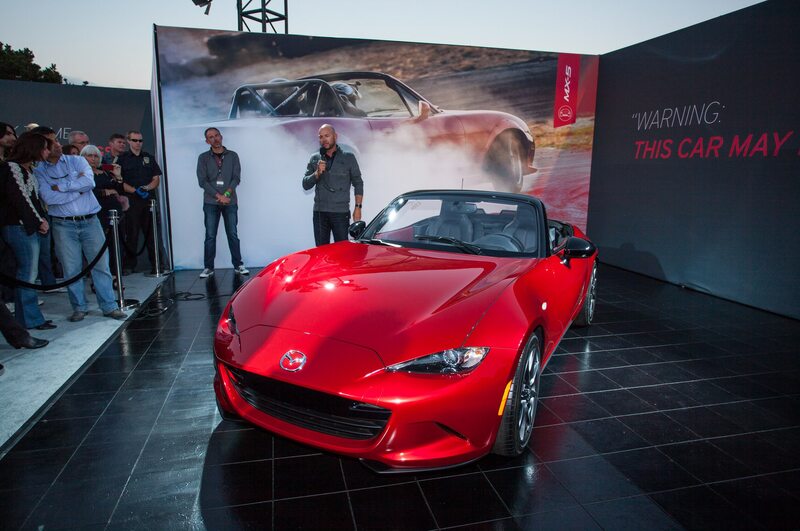 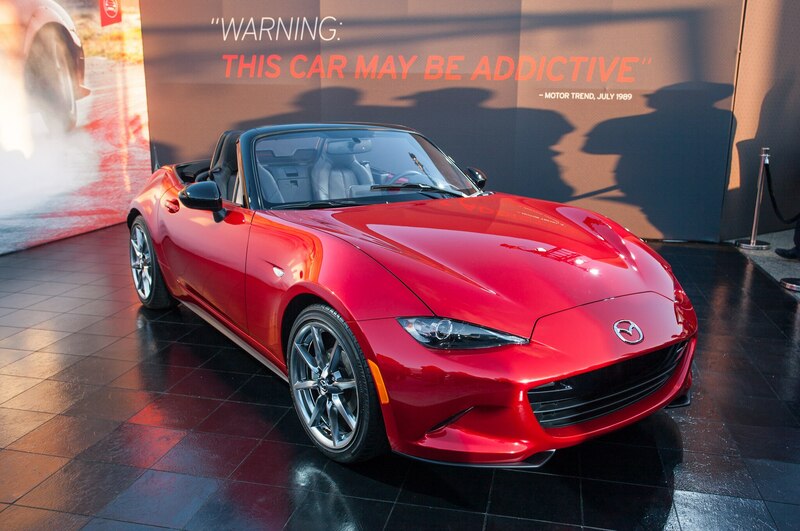 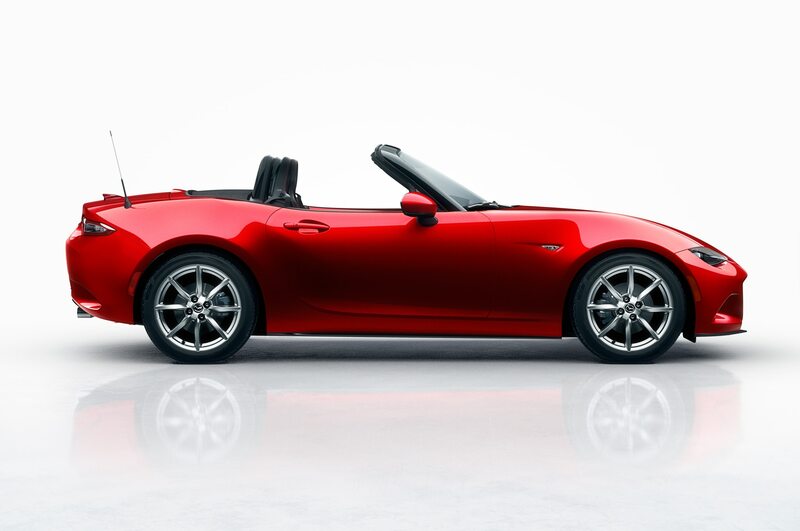 In fact, the 2016 Miata is nearly 200 pounds lighter than the 2015 Club version and within mere pounds of the 1.8-liter NA. 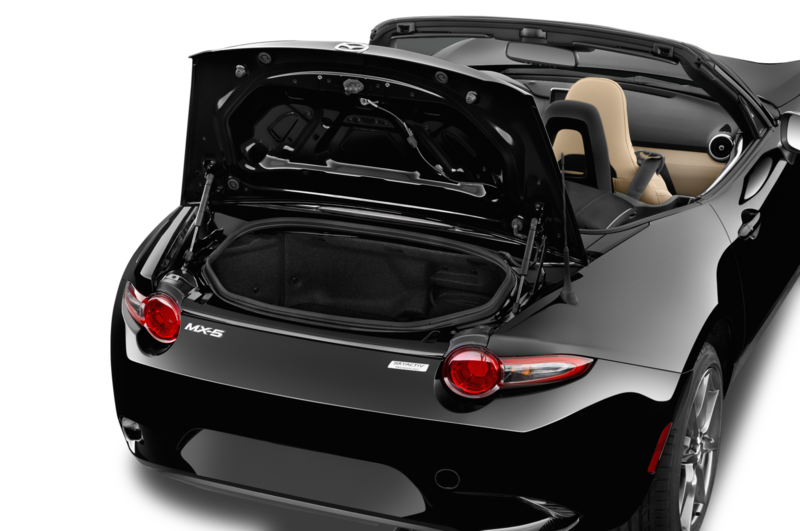 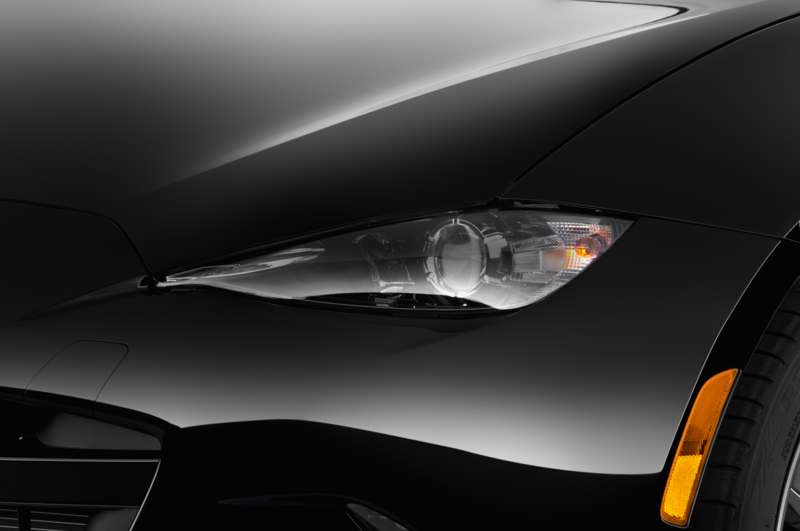 Thank increased use of high-strength steel and aluminum (the fenders, hood, trunk, bumper beams, and roll hoop supports are all made of the latter). 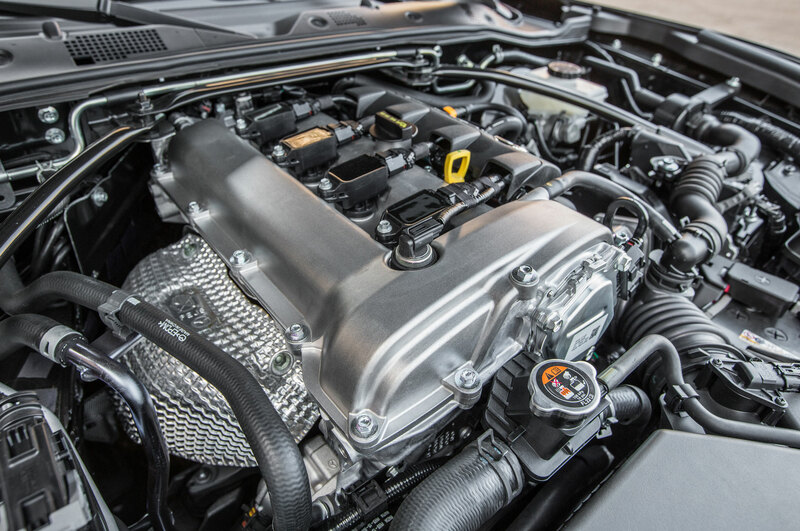 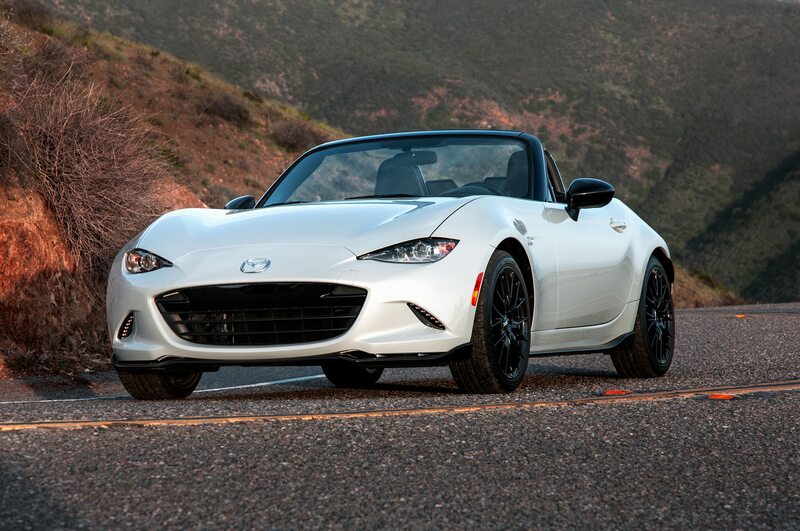 The polar moment of inertia is within a single percentage point of the original 1.6-liter NA. 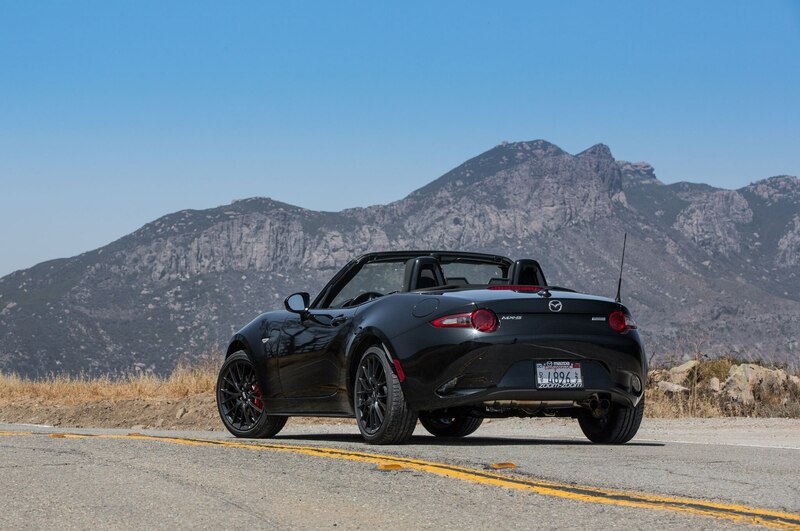 A brief foray across Mulholland and then I point the Miata back toward Decker Road, only headed downhill this time. 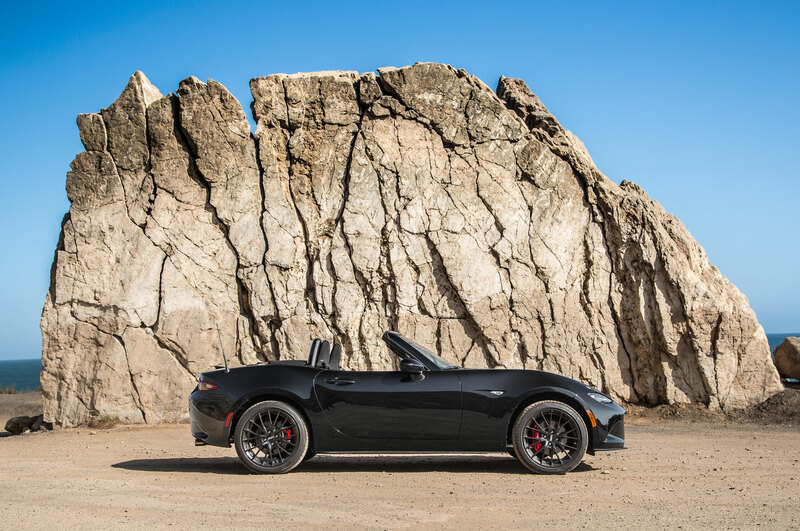 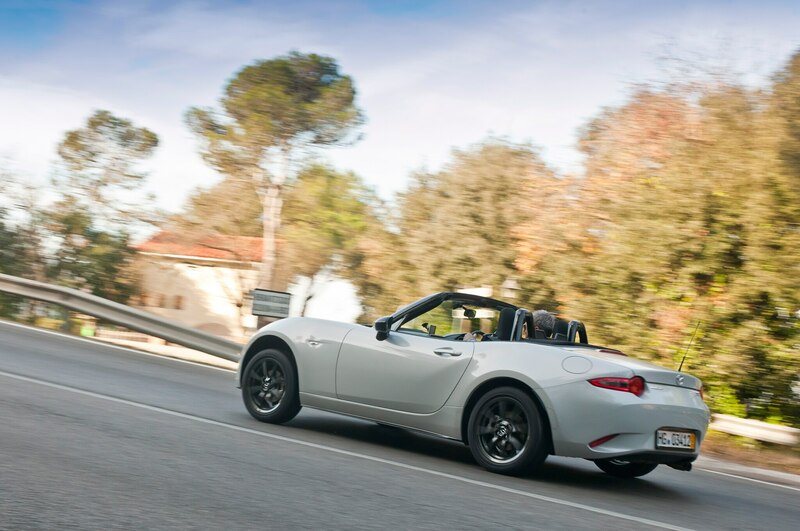 The Miata’s brakes seem up to the task; there’s a hint of hot friction material in the air, but the Miata never loses any stopping power. 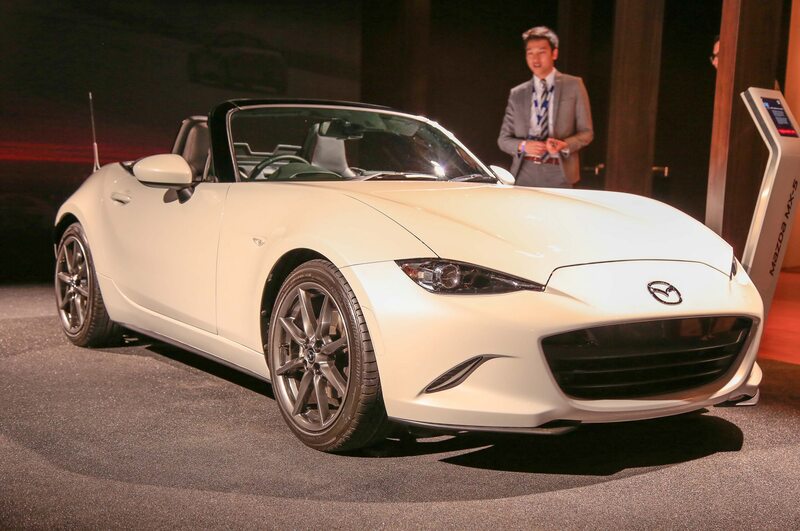 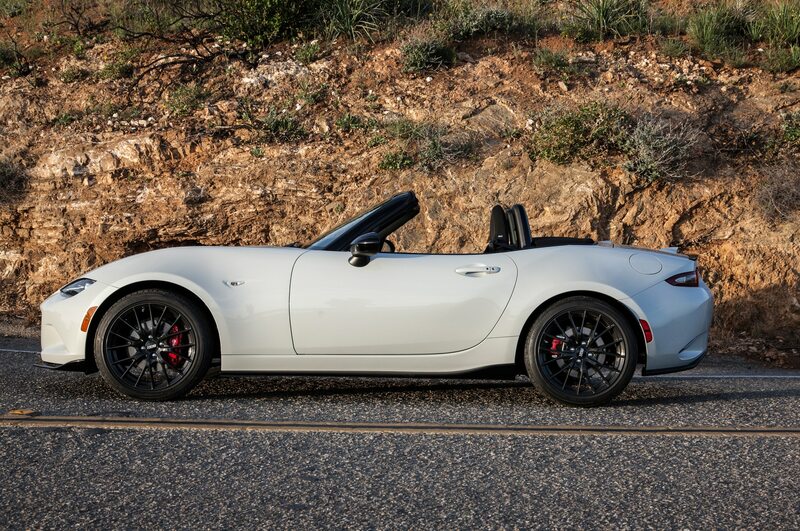 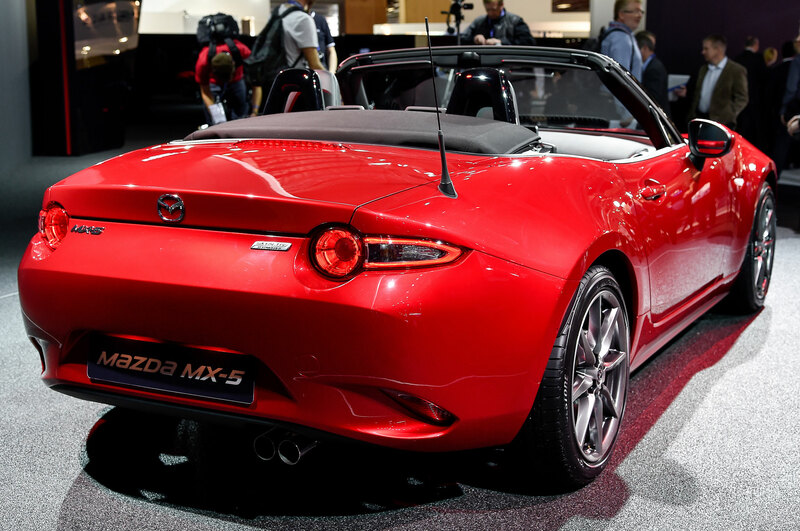 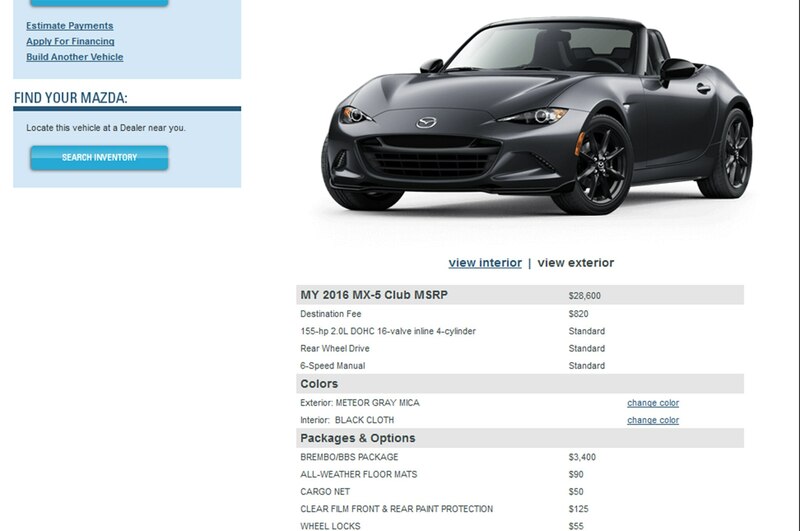 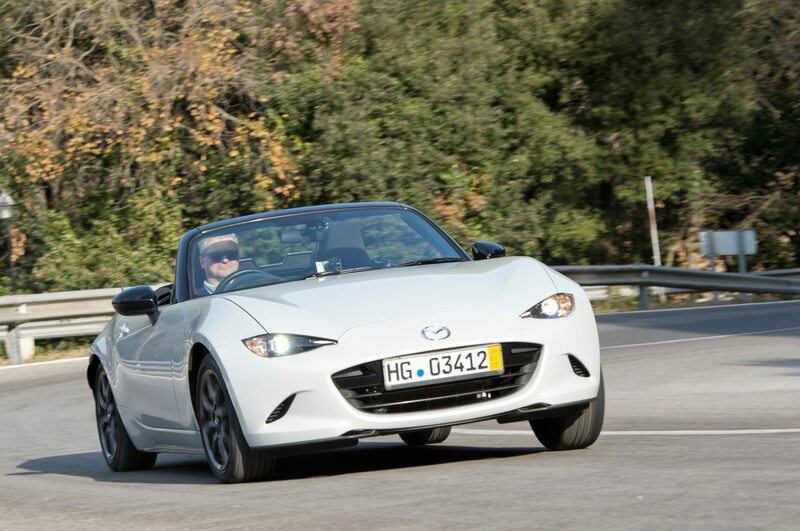 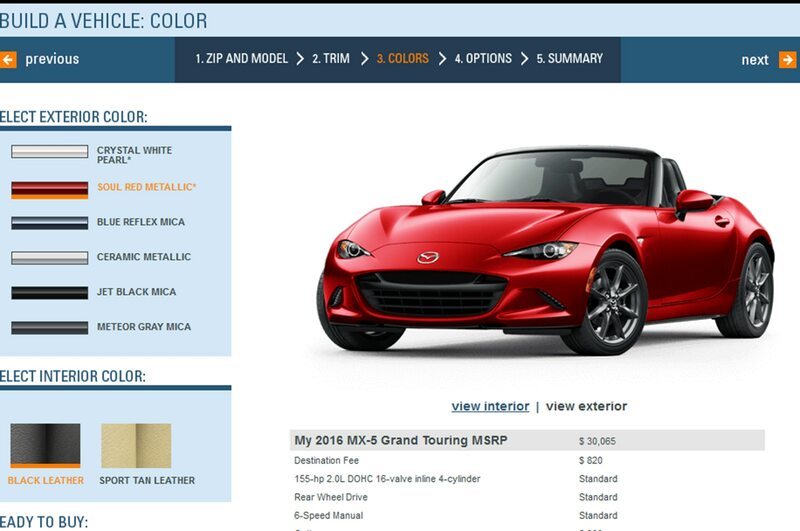 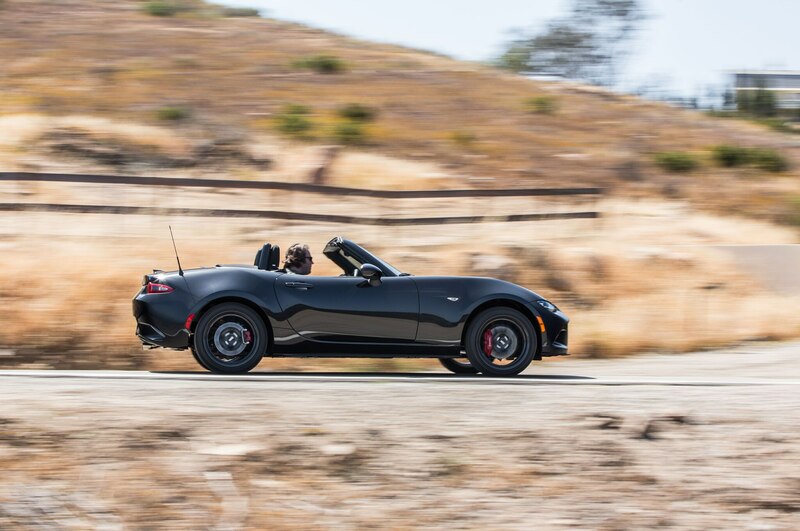 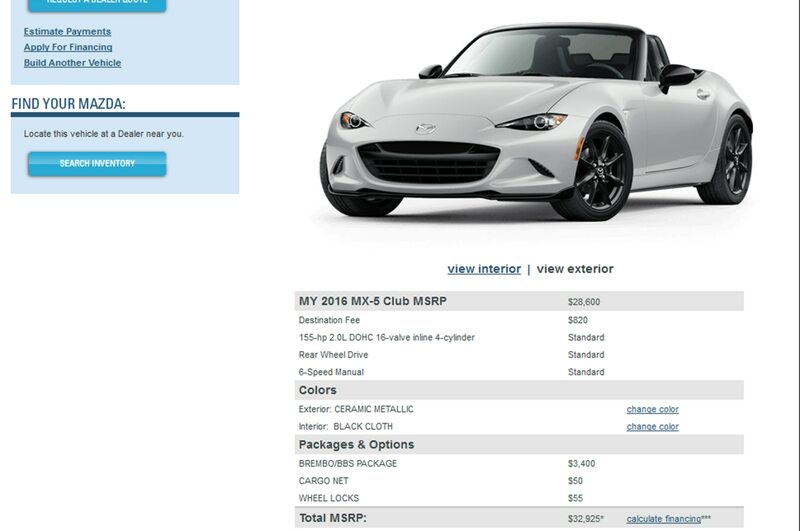 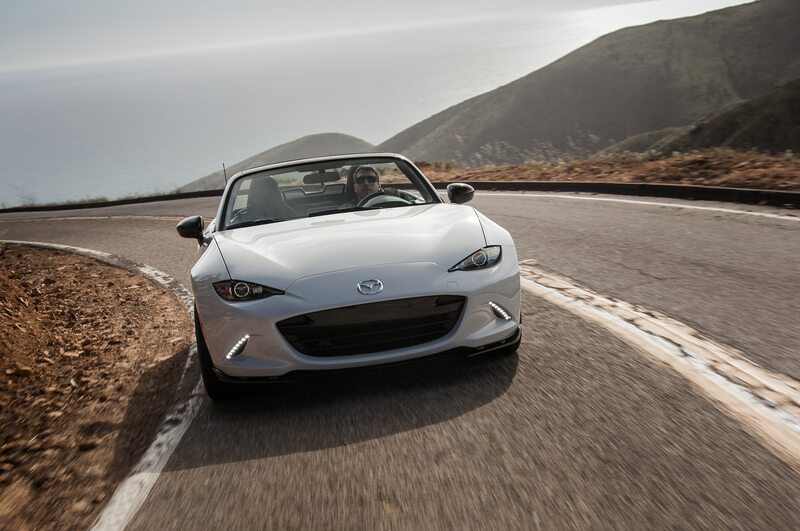 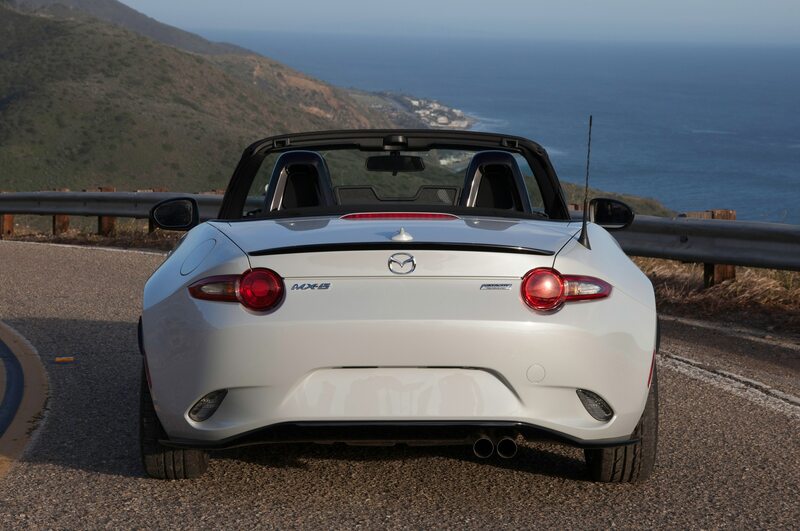 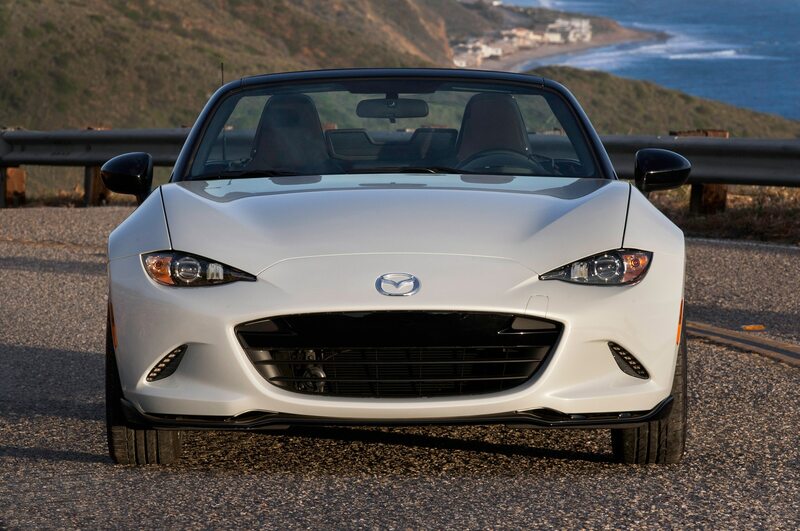 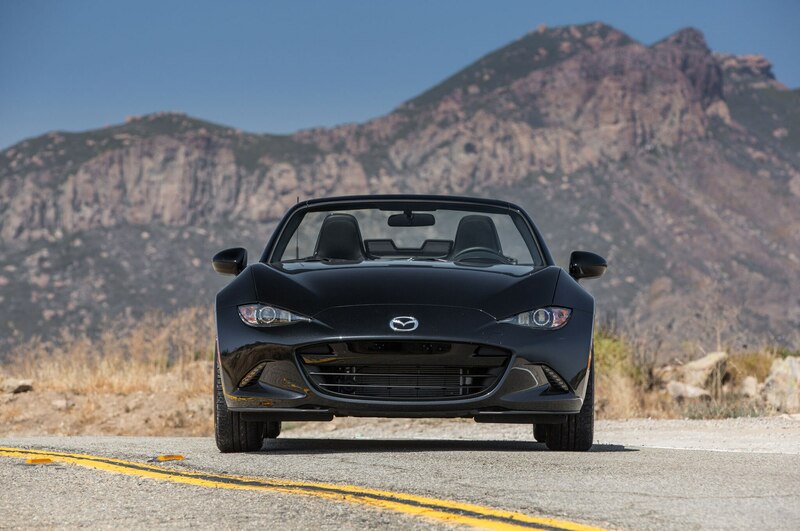 This new Miata seems like it was bred for the Malibu canyons and that’s probably because in part it was. 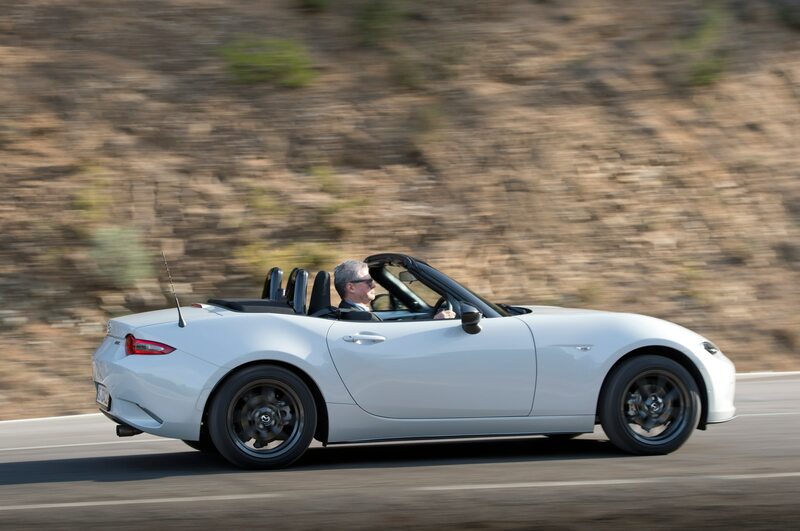 Miata’s California-based development crew no doubt spent plenty of time on these very roads. 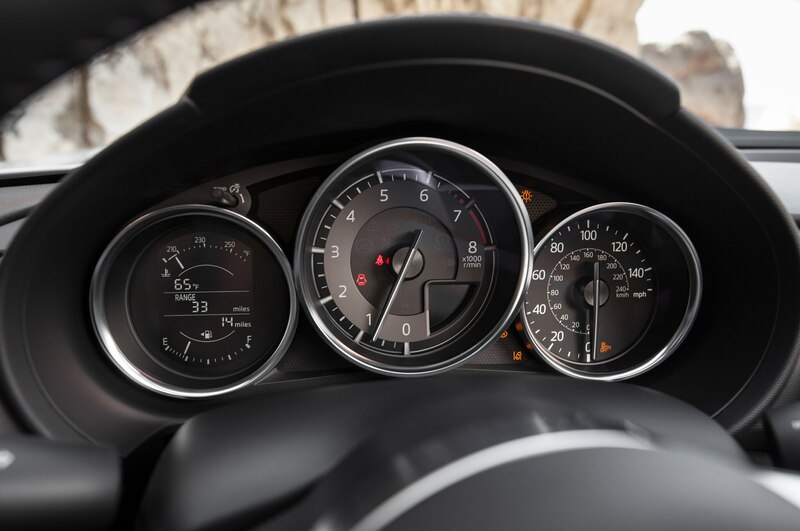 A glance at my watch reveals it’s a bit past noon — time to meet up with Automobile’s photo team for lunch at a local grocery store with an amazing deli. 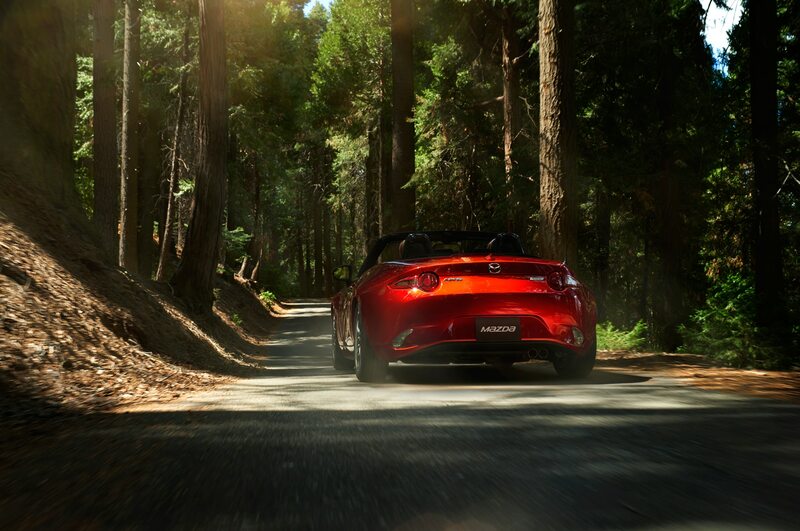 After we’ll spend the afternoon shooting around the same roads I’d spent the morning driving. 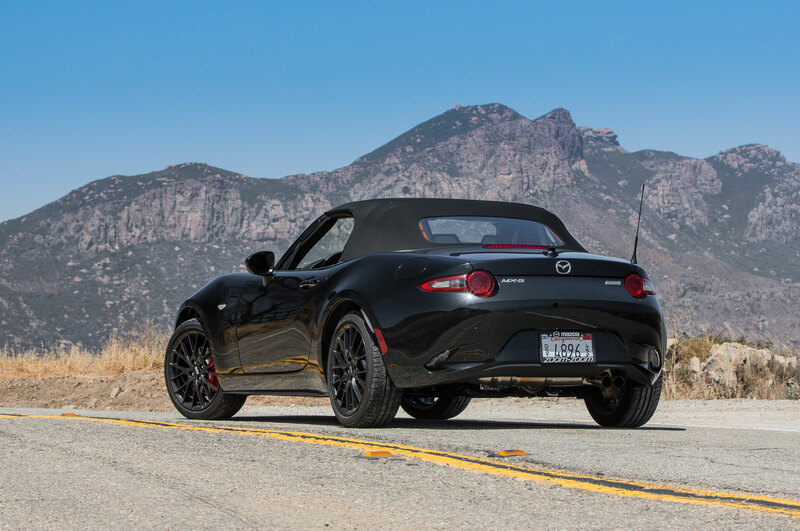 Yesterday, I tweeted out our lunch location, inviting any Miata enthusiasts in the area to come on down and have a look at the 2016 car in the sheetmetal. 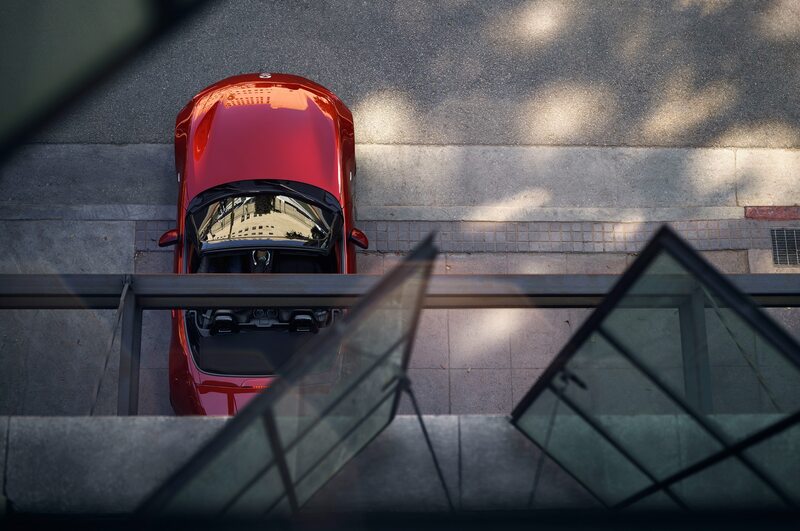 Climb around it; have a look inside. 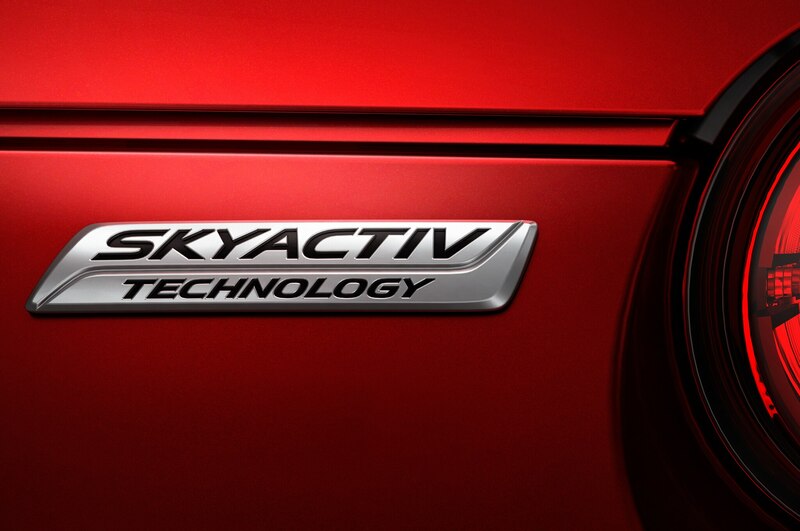 Mazda’s PR folks even gave me some stickers to hand out. 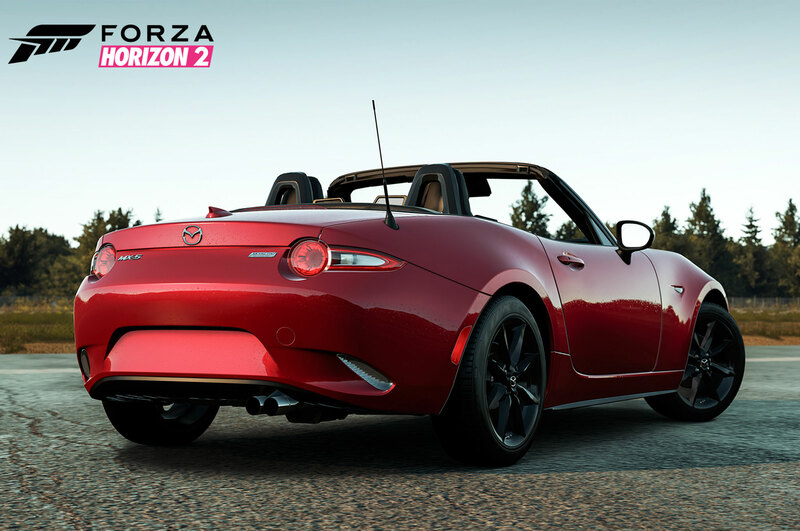 Will there be a crowd of people waiting? 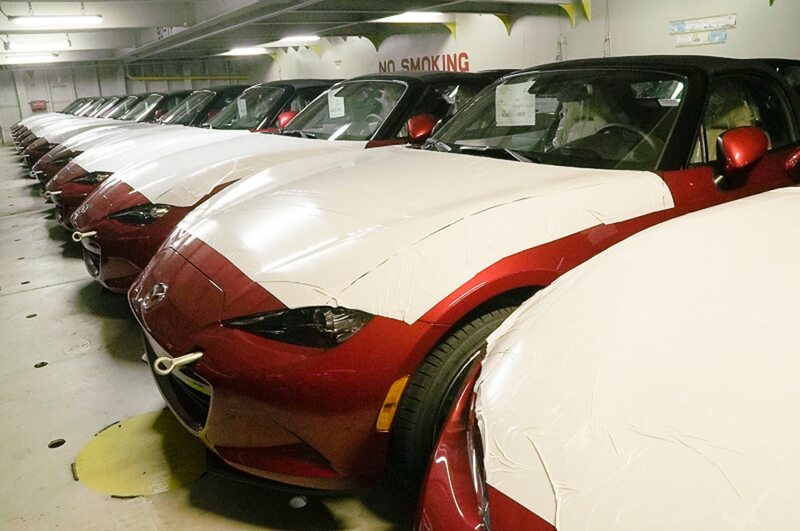 I find the parking lot behind Vintage Grocers virtually empty except for a lone, red NB Miata, its owner fervently polishing the hood with a microfiber and a bottle of detailing solution. 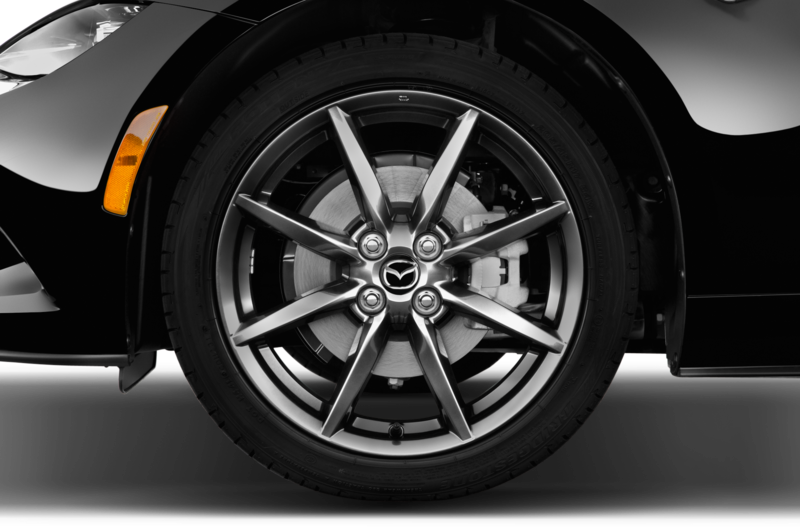 There are “pollo rampante” (prancing chicken) shields on the side of the front fender and big, red aftermarket brakes poking out from the spokes of aftermarket wheels. 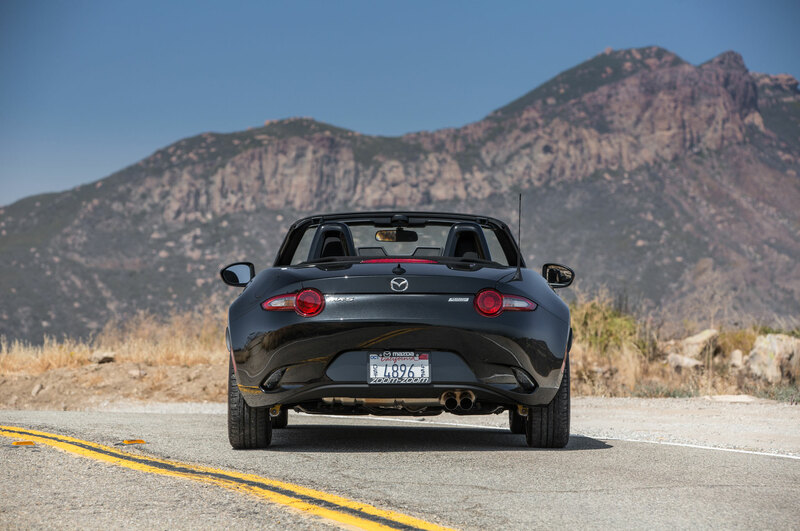 There’s a luggage rack on the trunklid because Mark, the car’s owner, and his wife have spent years road-tripping around the country and Miatas aren’t particularly well-known for their cargo space. 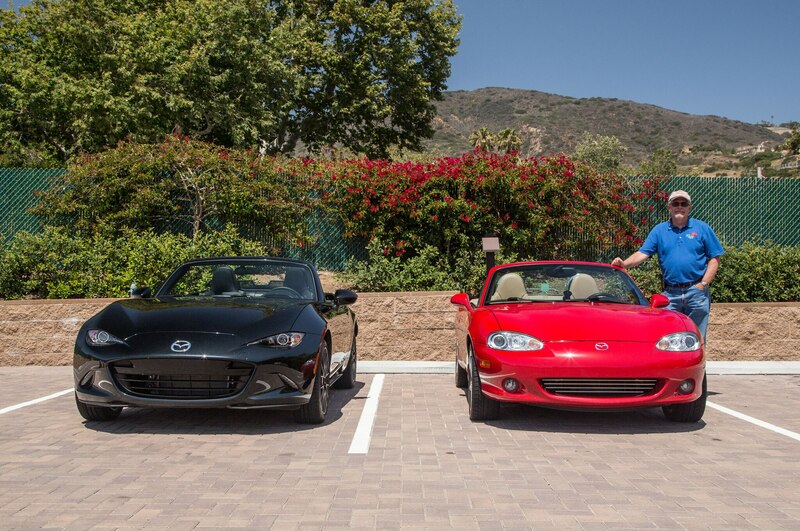 He got up early this morning and drove 200 miles in traffic to get here. 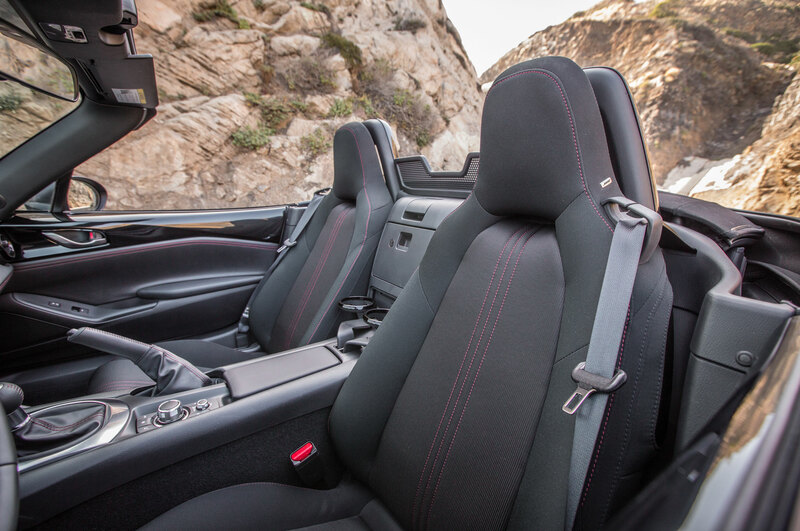 “It was worth it just to sit in the car,” he says. 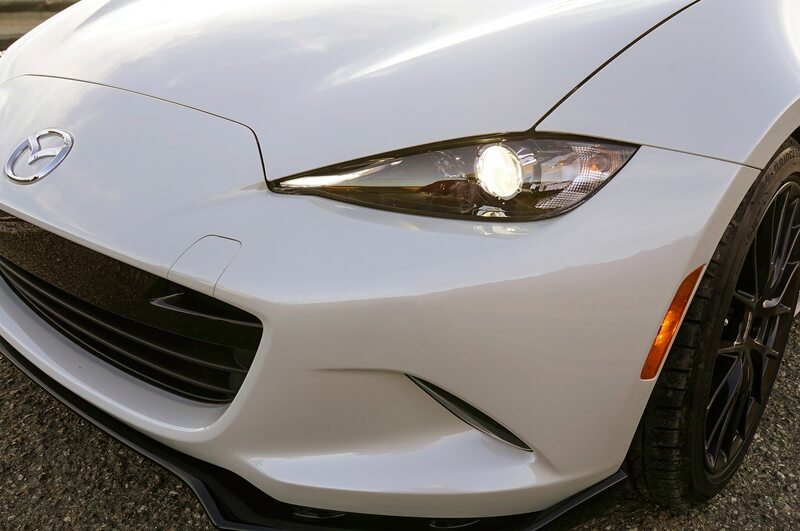 I’m not a morning person, but it was worth it to me, too. 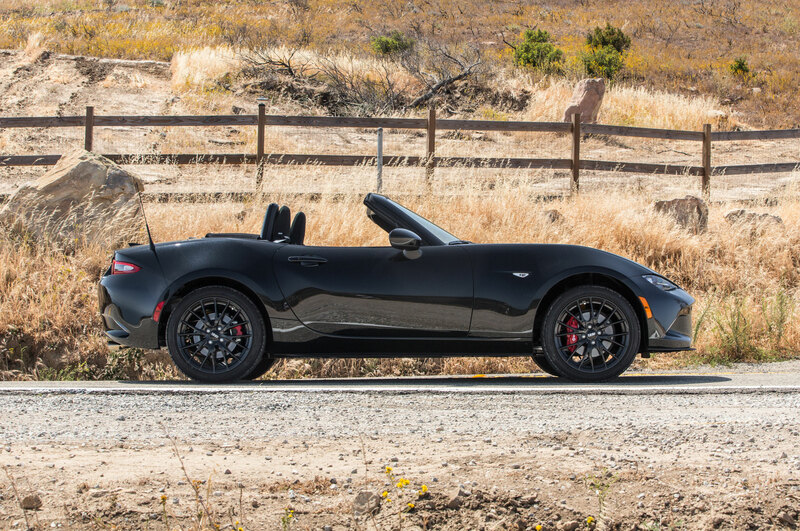 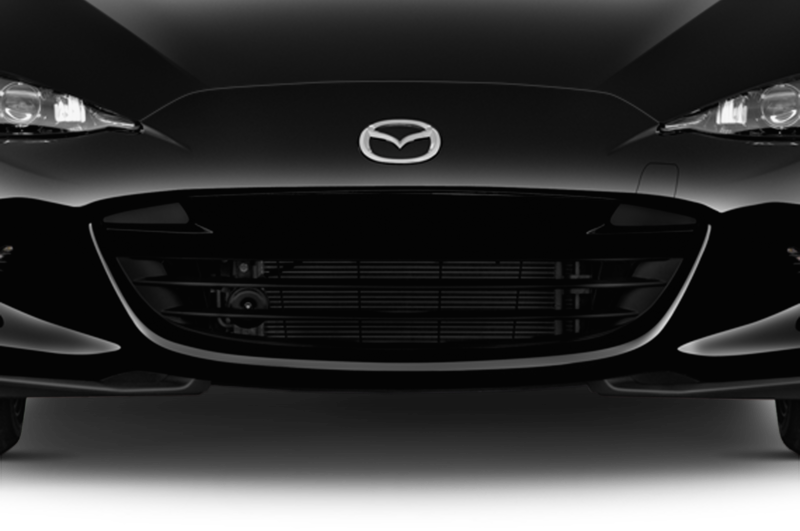 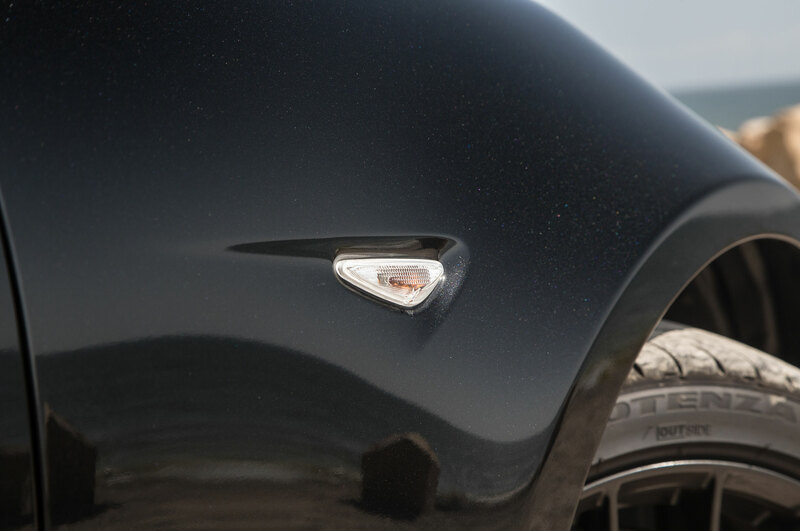 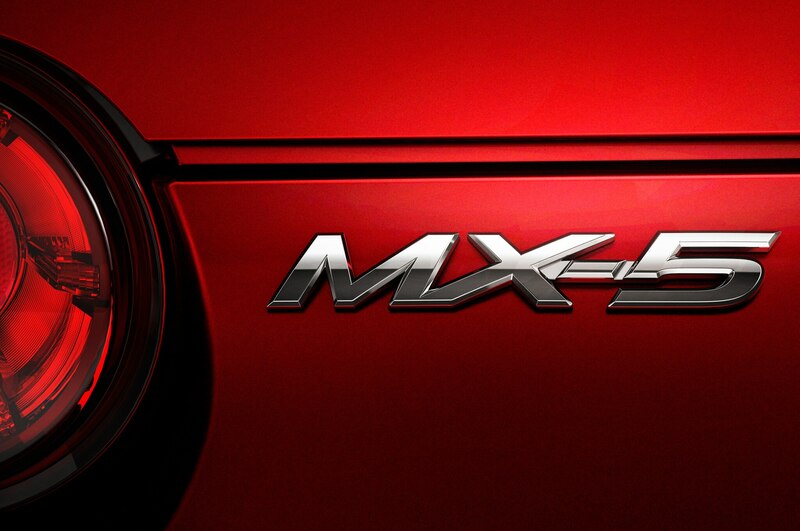 Guess there’s just something about a new Miata.